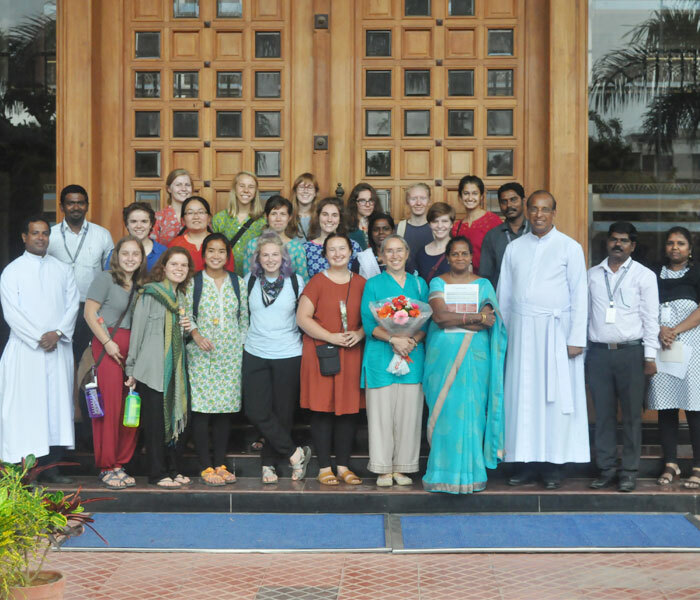 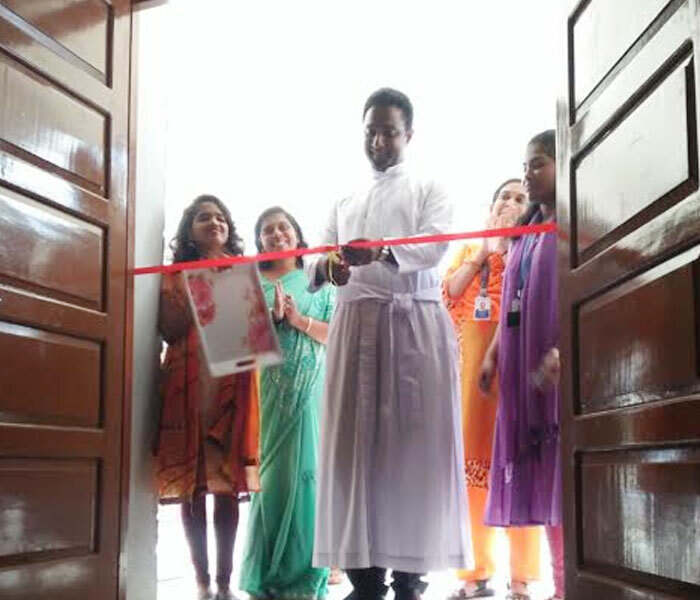 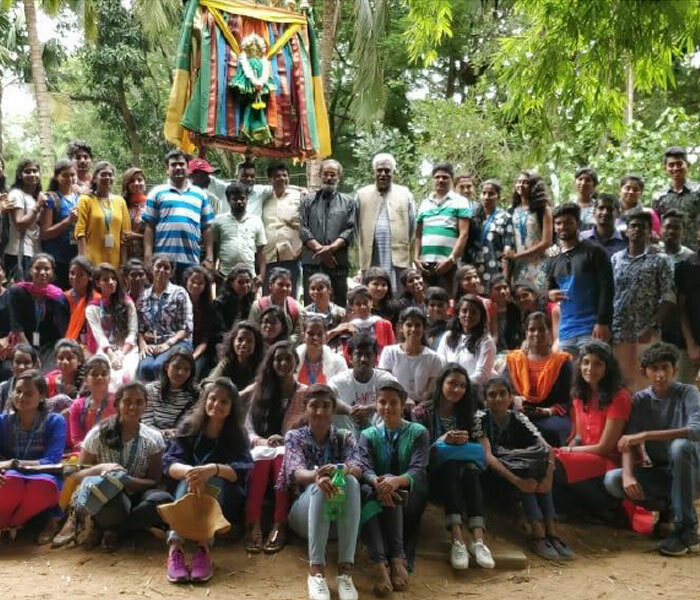 Kristu Jayanti College, founded in 1999, is managed by "BODHI NIKETAN TRUST", formed by the members of St. Joseph Province of the Carmelites of Mary Immaculate (CMI). 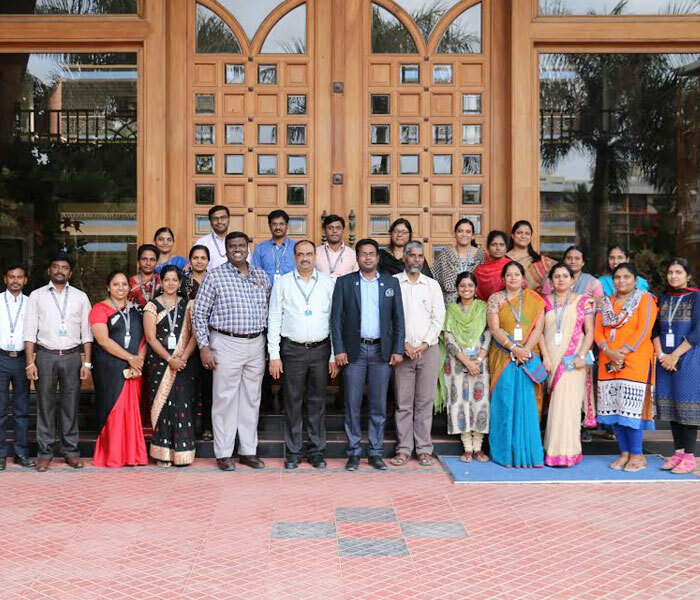 The college is affiliated to Bangalore University and is reaccredited with highest grade 'A' by NAAC in Second Cycle of Accreditation. 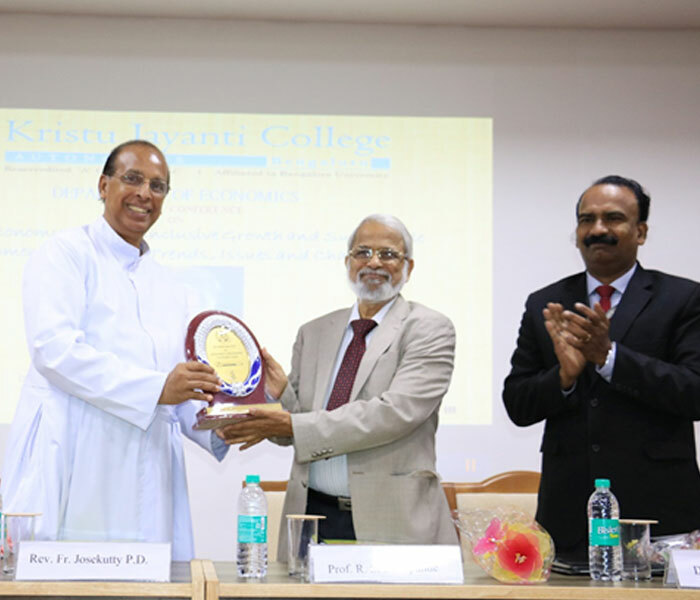 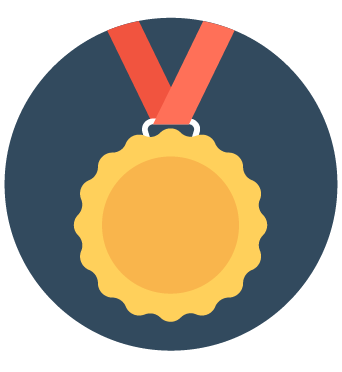 The college is recognized by UGC under the category 2(f) & 12(B). 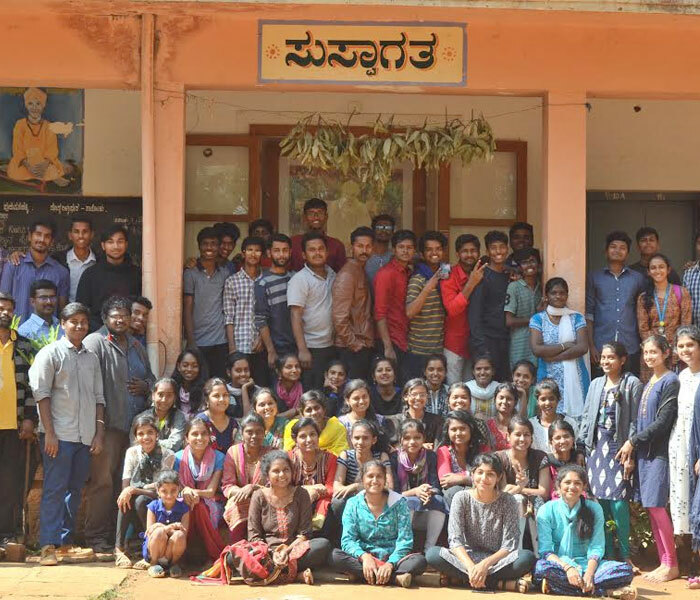 The college was accorded autonomous status from 2013 by the University Grants Commission, Government of Karnataka & the Bangalore University. 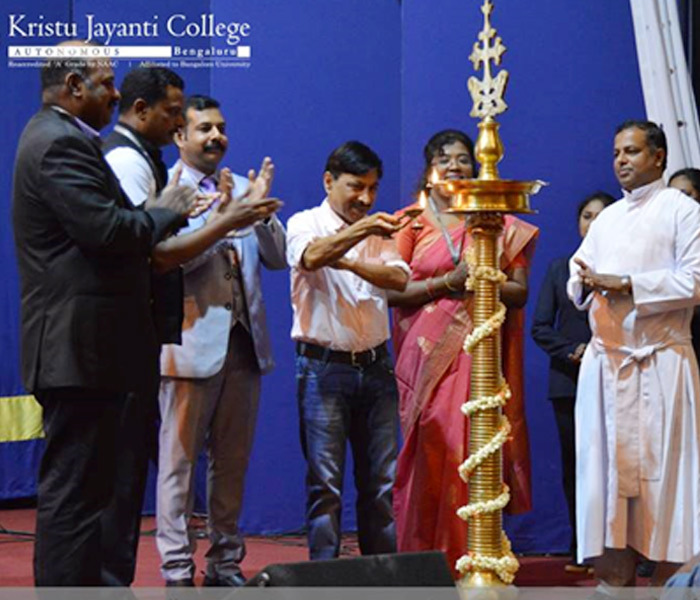 For its contribution in the field of education, Kristu Jayanti College was recently given the Heroes of Bengaluru award. 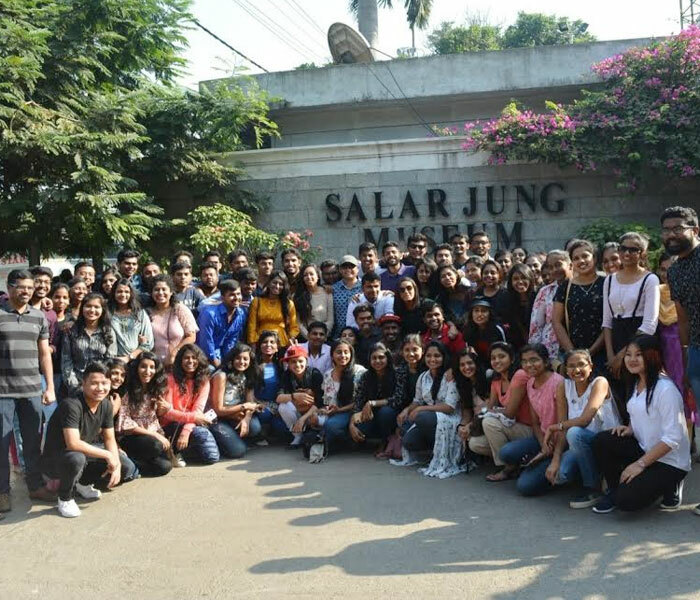 In the India Today - MDRA survey 2018 the college is ranked 5th Best BCA, 13th Best MSW, 15th Best BBA, 16th Best Commerce, 18th Best Arts and 26th Best Science College in India. 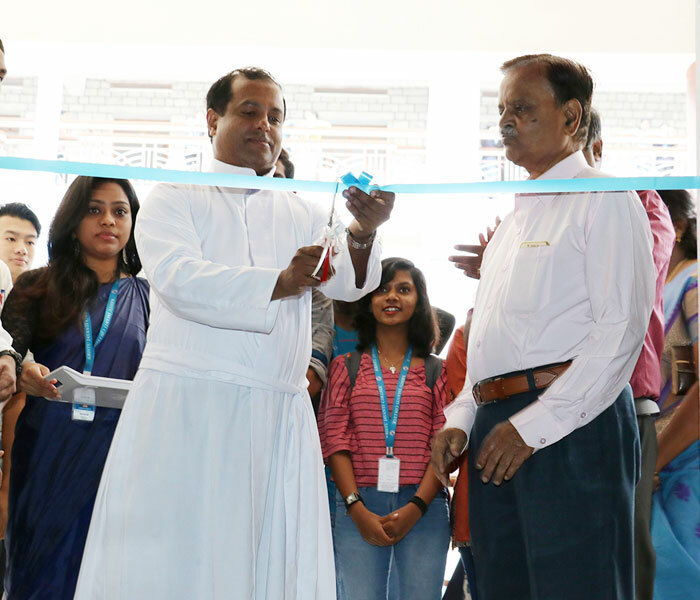 The College also ranked 2nd Best in BCA & MSW, 3rd best in Commerce, 4th Best in Arts & BBA and 5th best in Science among the colleges in Bengaluru. 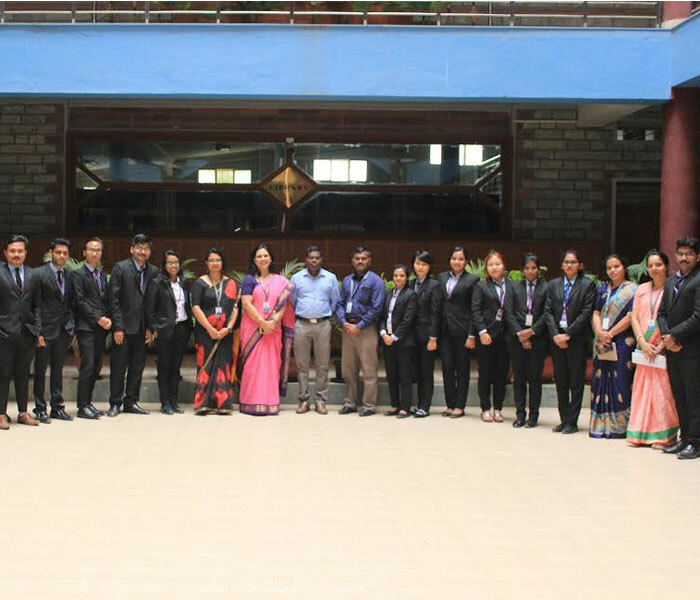 Welcome to GATE 2018-19. 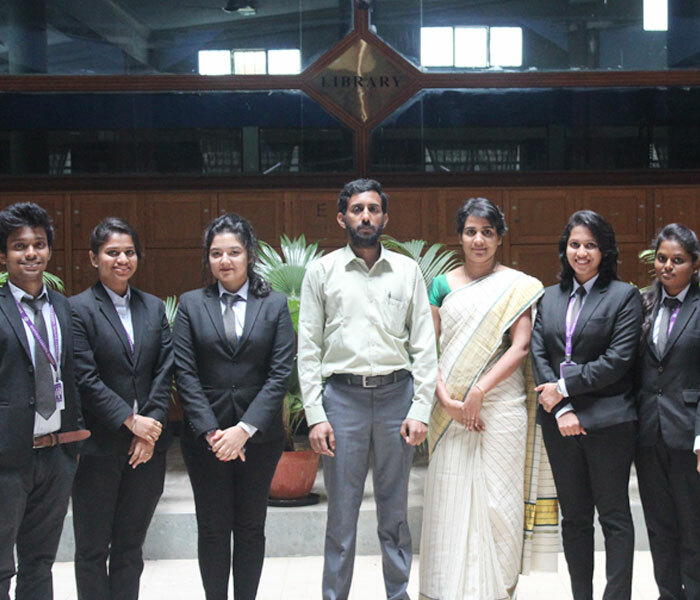 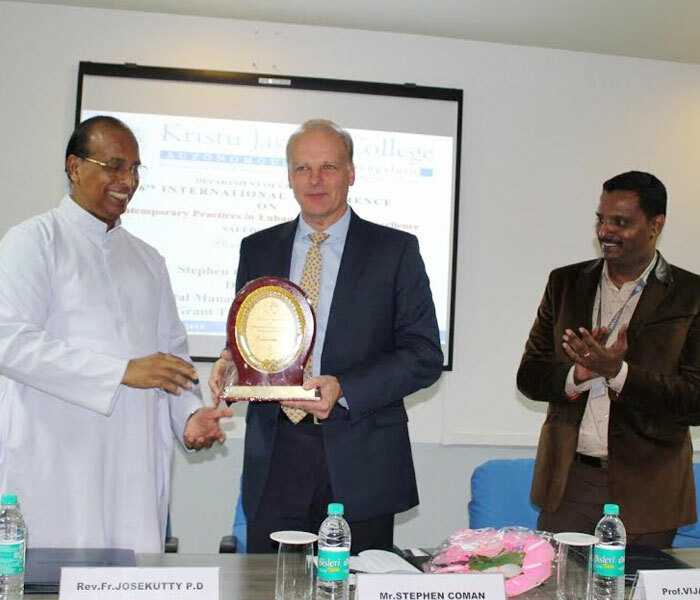 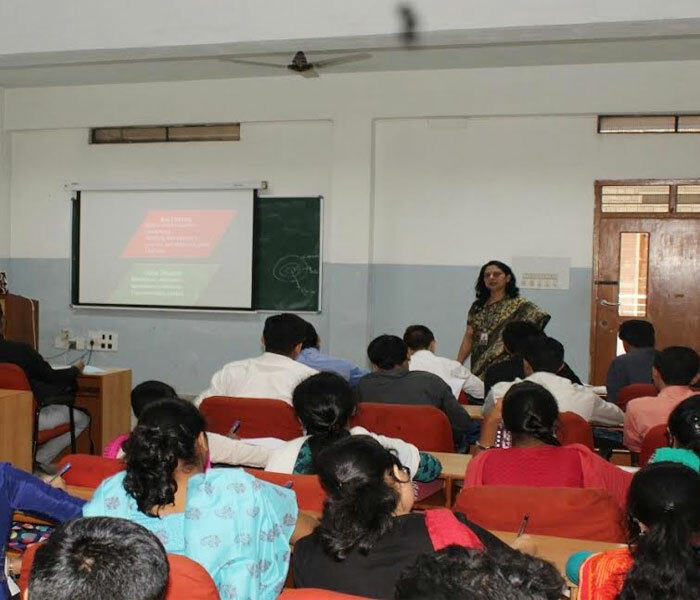 In Kristu Jayanti College Centre for Employability and Corporate Relations (CECR) acts as .. 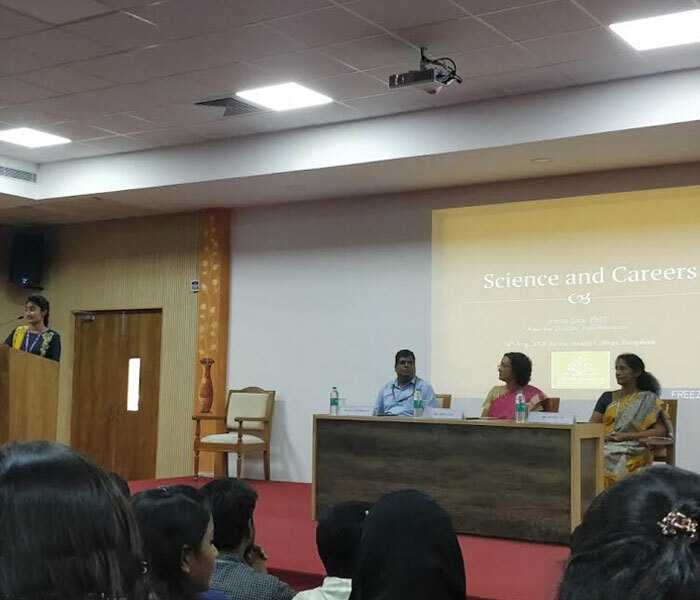 The Department of Life Sciences is conducting a workshop on Techniques in Molecular Biology..
Department of Journalism and Mass Communication, Kristu Jayanti College, Bengaluru organized a rural exposure programme..
Department Of Psychology had organized a national level Faculty Development Programme (FDP)..
Creatrix 2018, an intra collegiate science exhibition steered annually by the Department of Life Sciences was organized..
Department of Economics organized a guest lecture on “Conservation, Sustainability and Enhancing .. 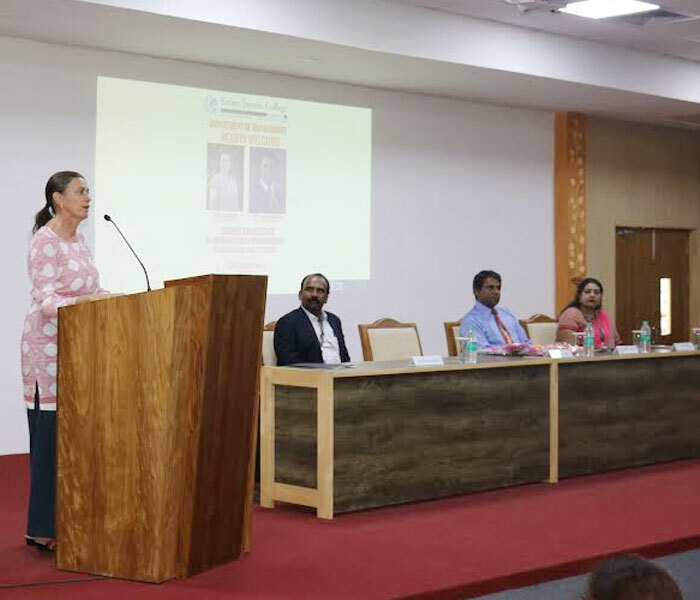 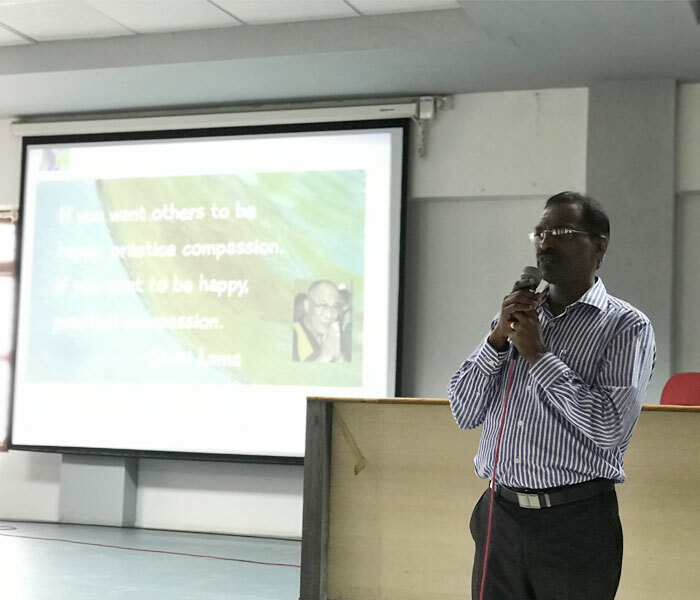 The Department of Social Work organised a Social innovation lecture on Economic Rights and SDG-1 (No Poverty) ..
As part of the social innovation lecture series, the Department of Social Work organized a lecture.. 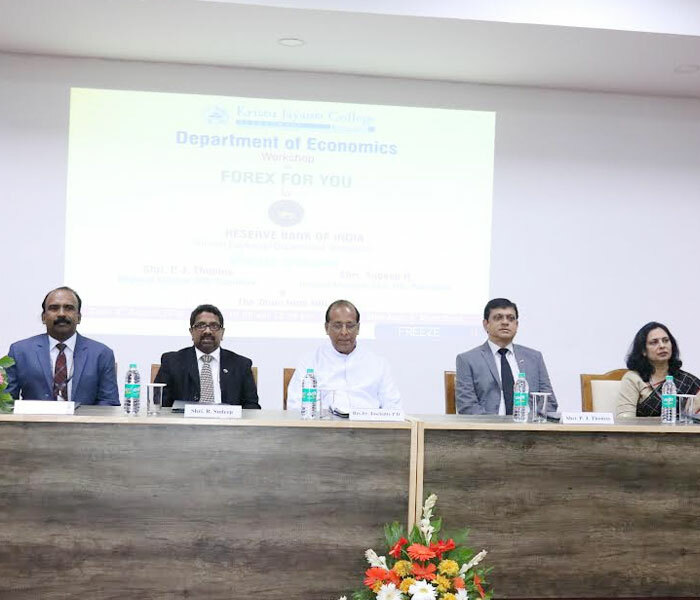 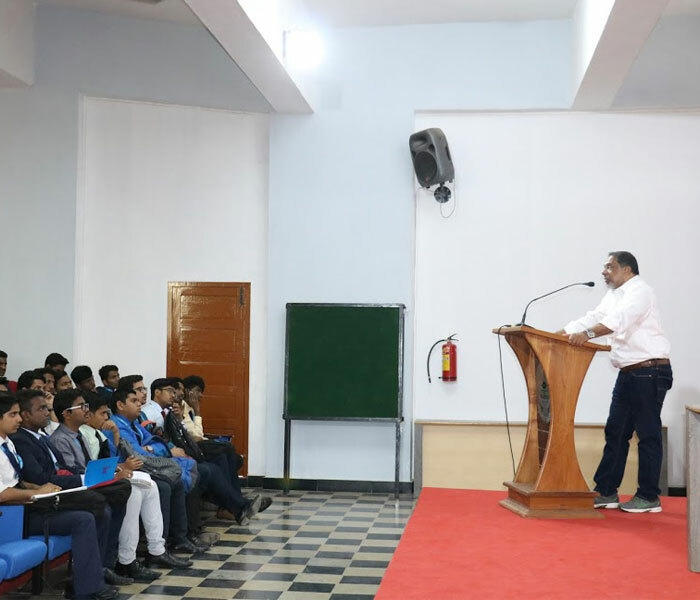 The Department of Social Work, Kristu Jayanti College in association with International Justice Mission (IJM)..
Mr. Thilak Raj and Mr. G.Vijay Raghavan spoke about Capital Markets in India and how to invest, where to invest.. 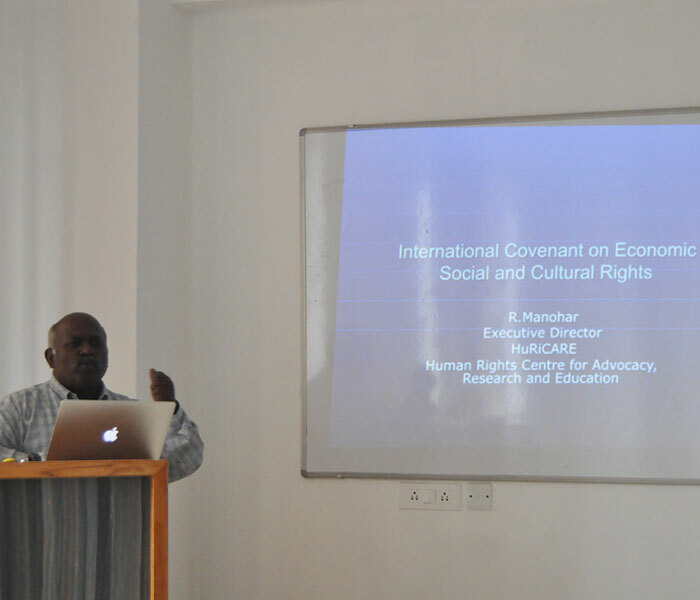 The Department of Social Work in collaboration with the Centre for Employability and Corporate Relations (CECR).. 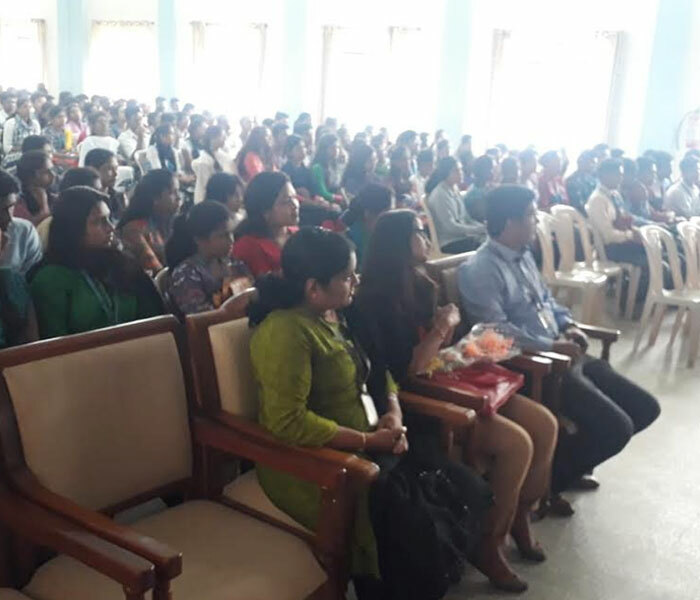 The Centre for Social Activities organised the Rural Exposure Camp from 06/12/2018 to 09/12/2018..
Department of management of our college has made it a quest to organize this conference to bring together.. 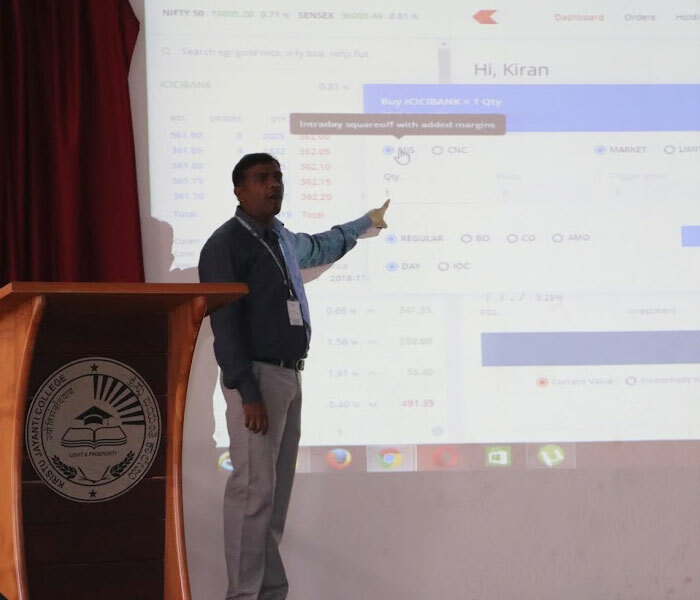 The Second National Conference on Computational Intelligence has seen the participation from across the nation..
How to open an account: He spoke about the procedure of opening an account with the registered broker..
Mr. K. Kiran Kumar insights the session on Investment Opportunities in India along with He was highlighted Stock Market.. 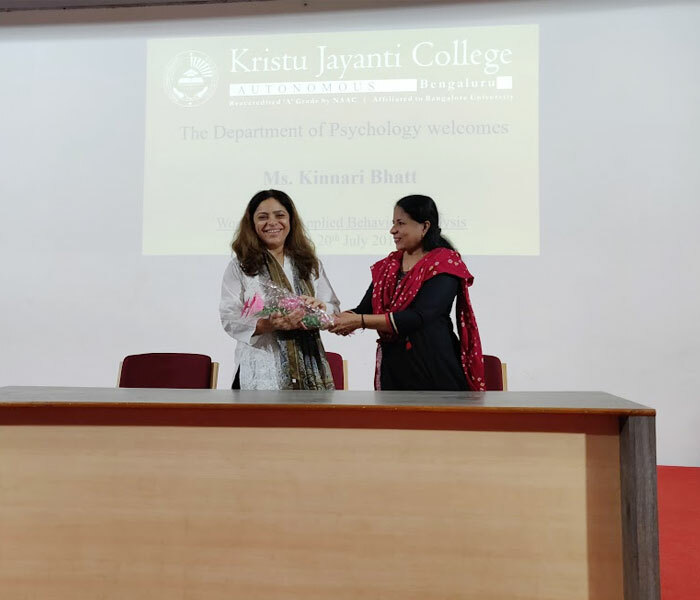 The Department of management never fails to bring all the possible brightness for their students..
Department of English organized an Intra Collegiate Fest on 28/11/2018 at Kristu Jayanti College.. 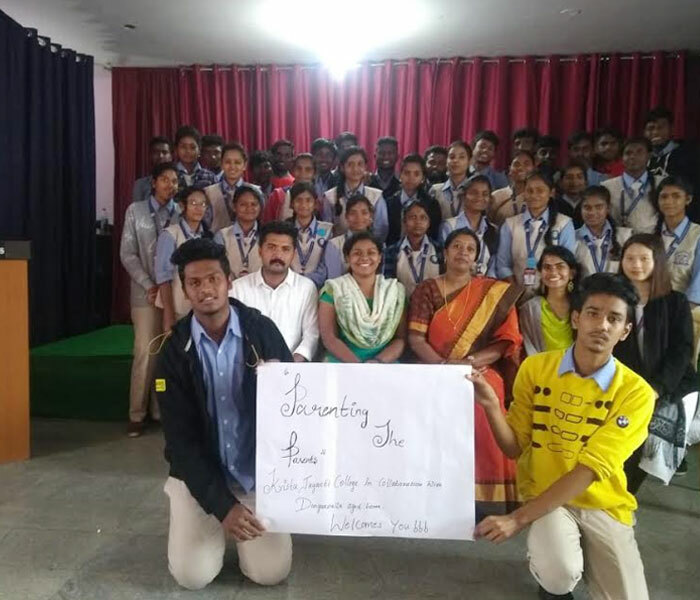 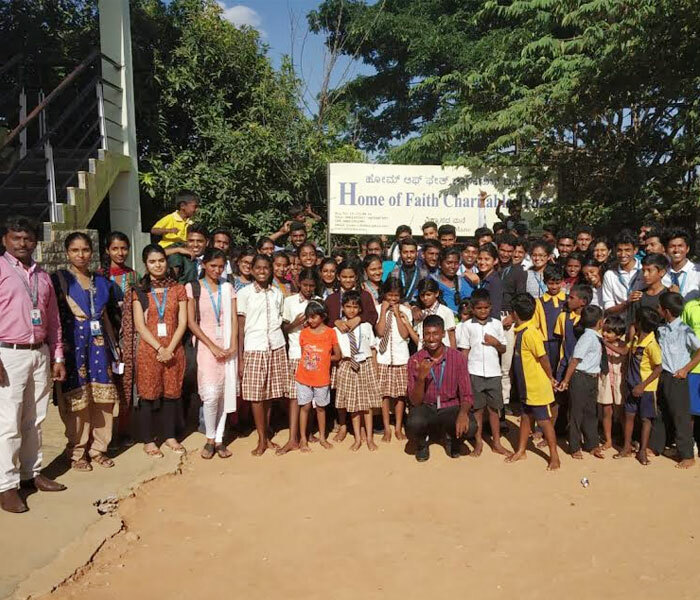 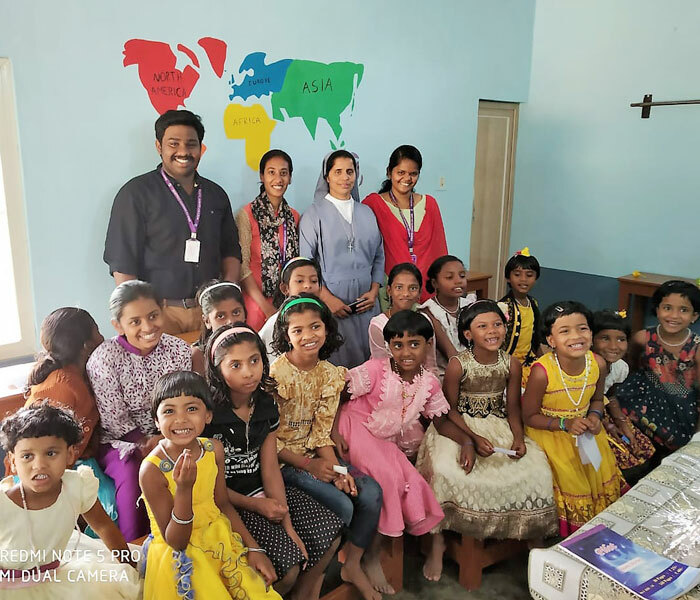 The students of Social Work organized a community outreach programme for the students..
3 Days Industrial Trip to Hyderabad with 75 Students and 3 Faculty Members..
TThe students of social work in association with FIDES (Family Integral Development and Education.. 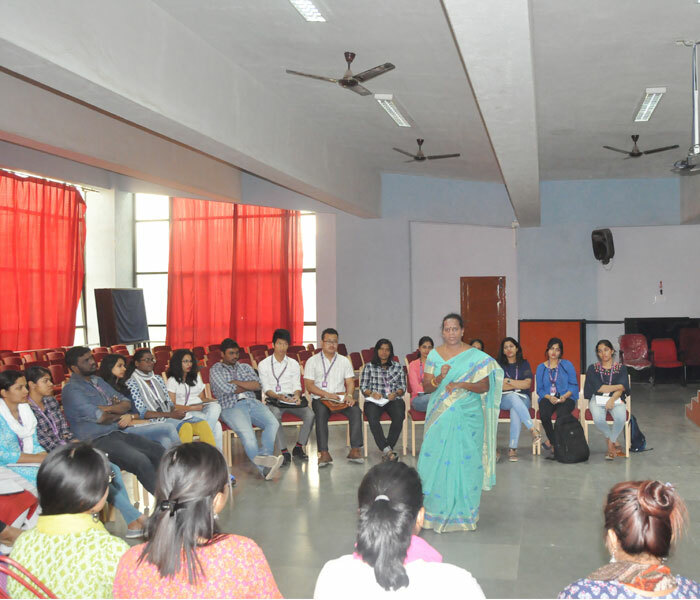 The students of Social Work organized a programme on Menstrual Hygiene for Mothers.. 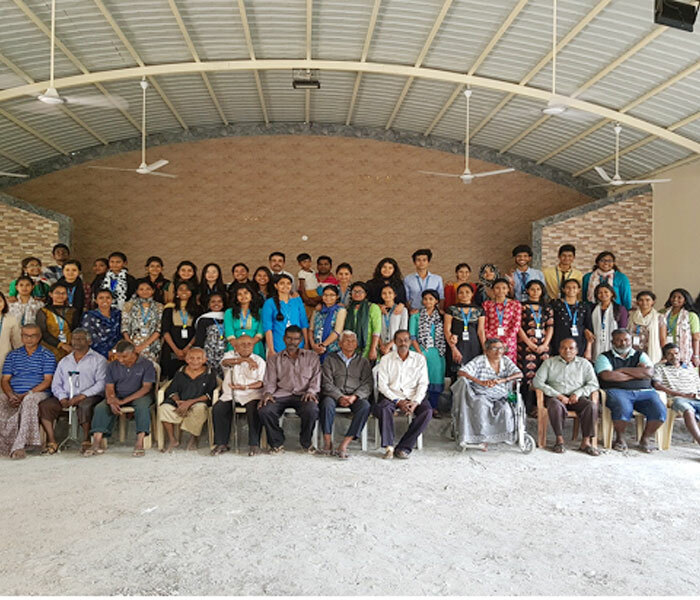 The students of Social Work organized a Community Development Programme on Strengthening.. 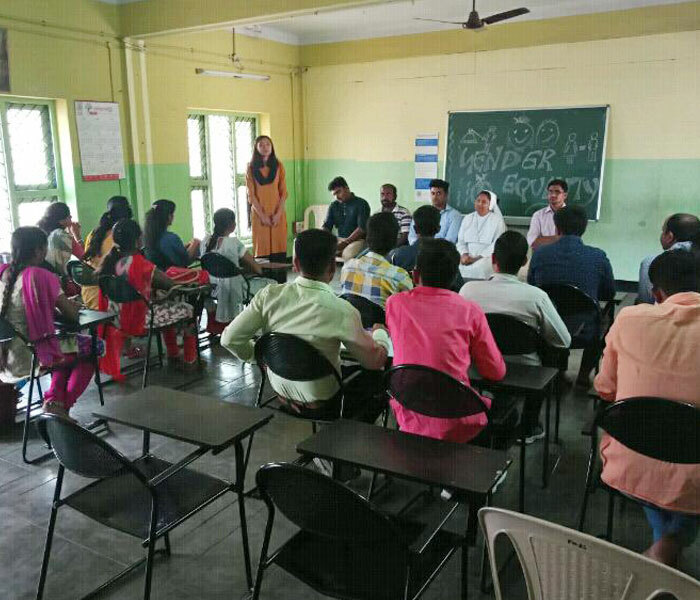 The students of social work in association with Shishu Mandir (An NGO Working for Children).. 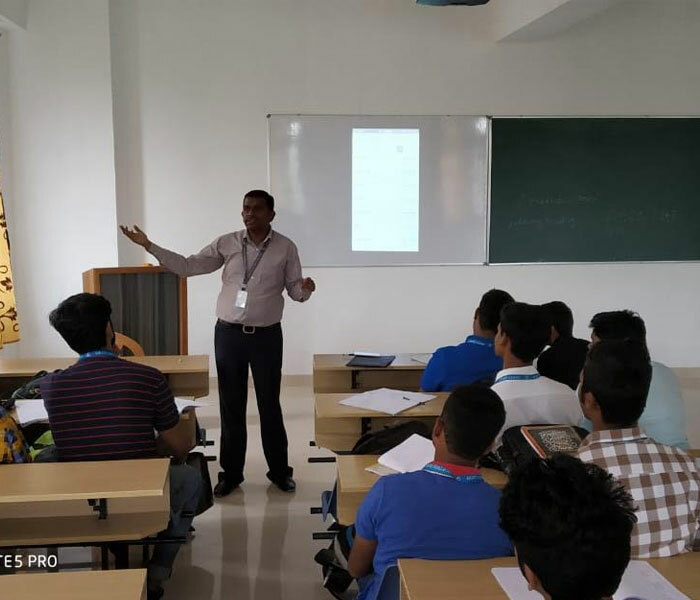 The objective of FDP is focused program aimed at helping learners create applications using Google's Android open-source platform.. 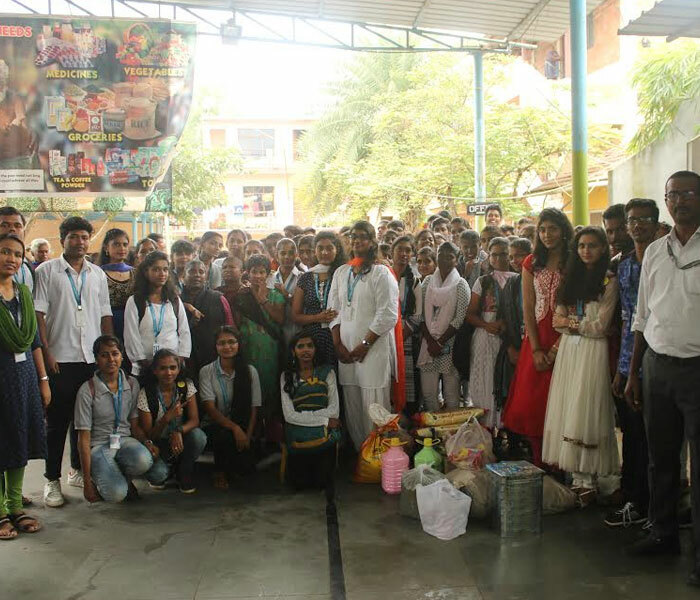 The students of Social Work in association with SATHI (Society for Assistance to Children in Difficult Situation)..
Kristu Jayanti College in collaboration with Shri Rishi Prabhakarji of Rishi Samskriti Vidya Kendra organized NSS Annual..
Dr. N. Nagambika Devi IAS, Principal Secretary, Department of Higher Education, Govt. 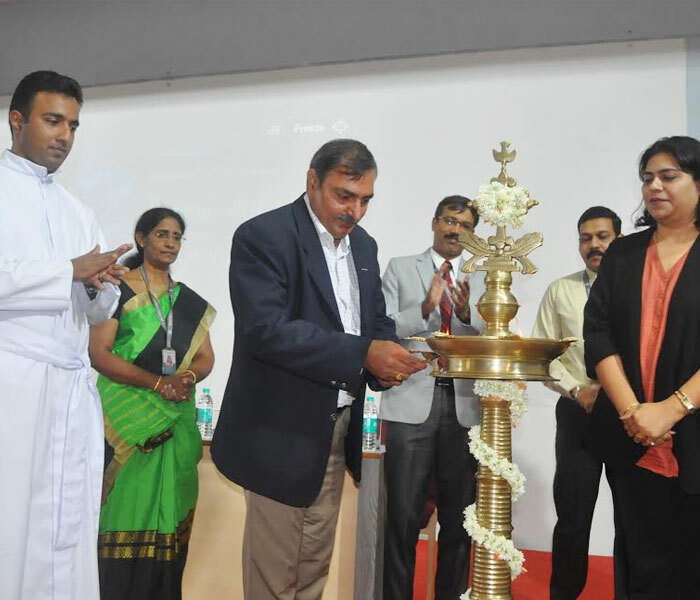 of Karnataka inaugurated.. 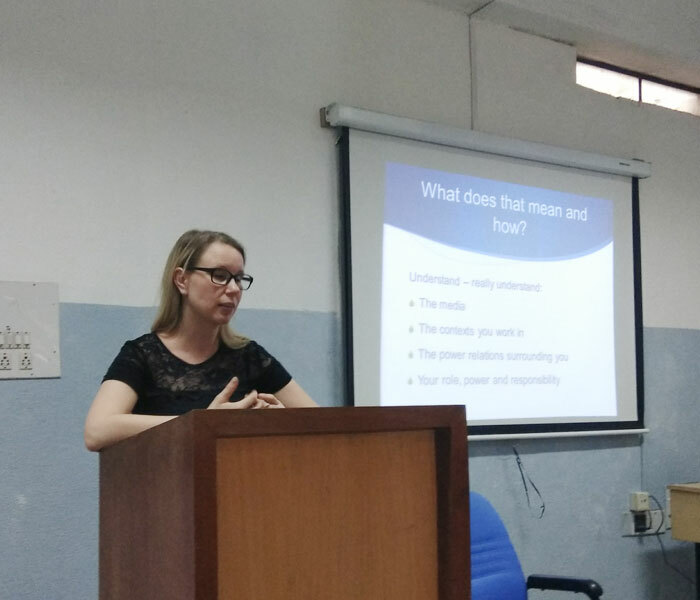 The Department of Social Work in collaboration with MEE and Xtraa Netherlands conducted a two-day training.. 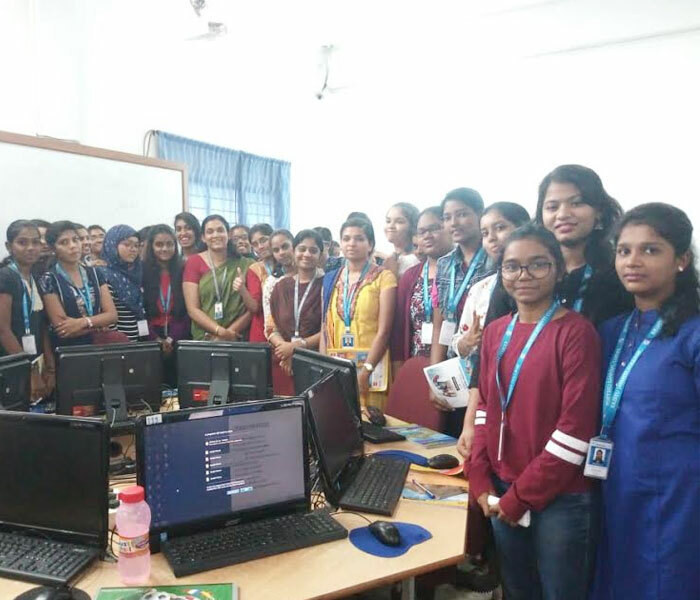 The students of social work in association with People’s Trust organized a Community Development..
Department of Computer Science (UG) of Kristu Jayanti College in Association with IEEE organised Two Days workshop.. 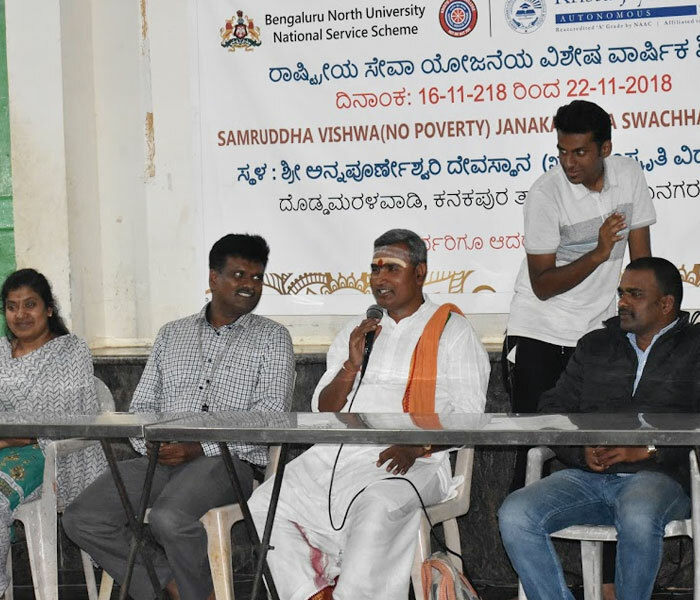 The students of Social Work in association with Sumangali Seva Ashrama organized special programme ..
As part of the celebration of World Cities Day-2018, the Department of Social Work in collaboration with World Vision India.. 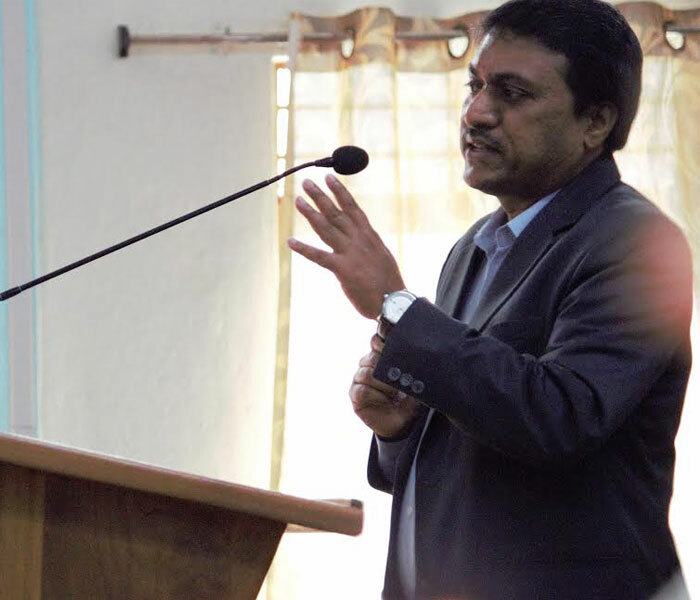 The Department of Journalism and Mass Communication organized a guest lecture on Introduction to Magazine Journalism.. 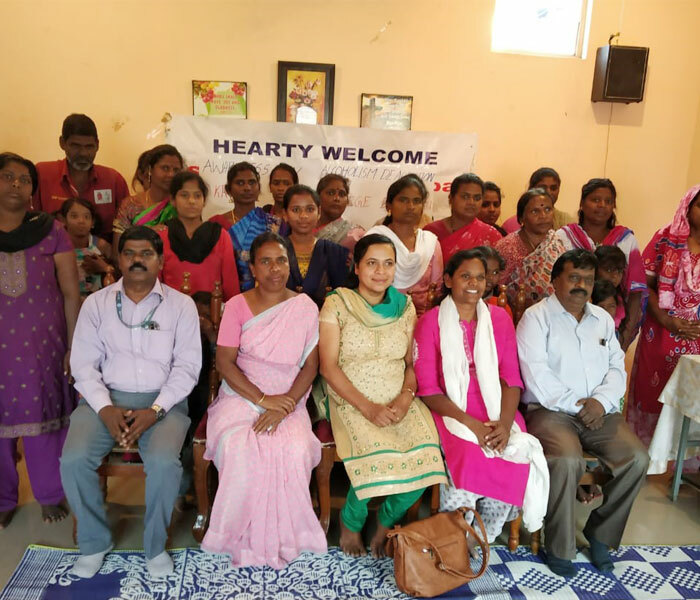 The Students of the Department of Social Work and PROCEED Family Counselling Center, Lingarajapuram.. 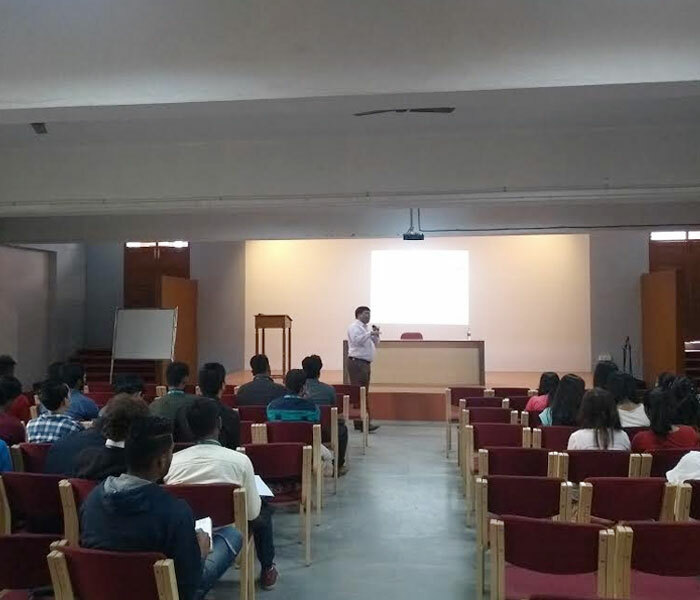 The Department of Tourism and History collaborated and organized Expert Lecture on “Heritage Conservation Management- Role of Youth”.. 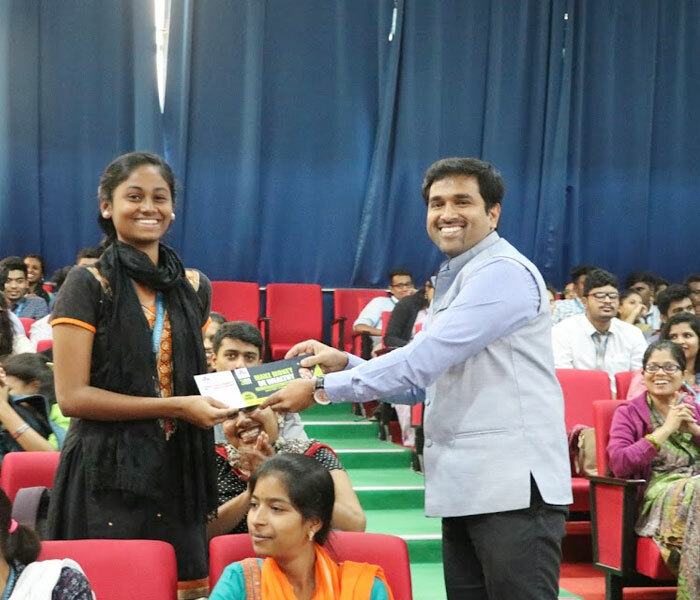 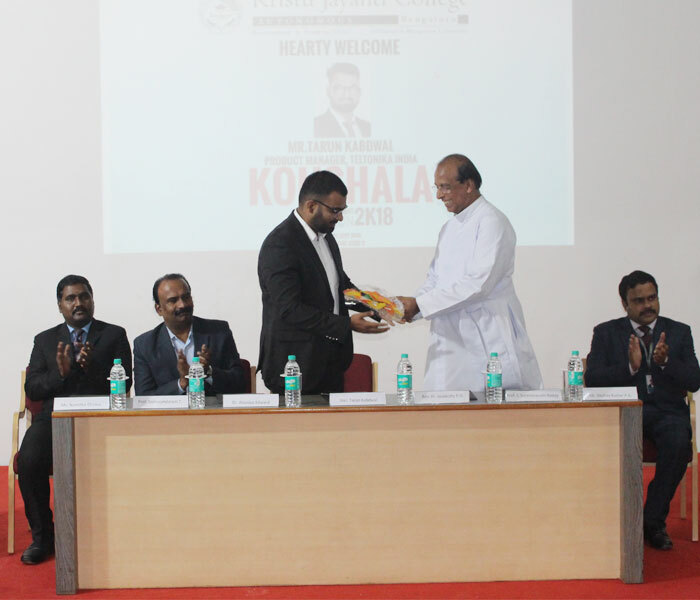 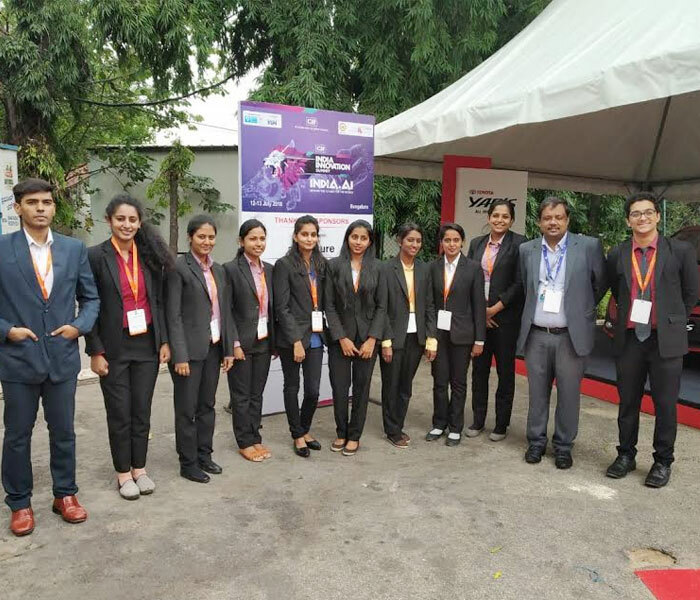 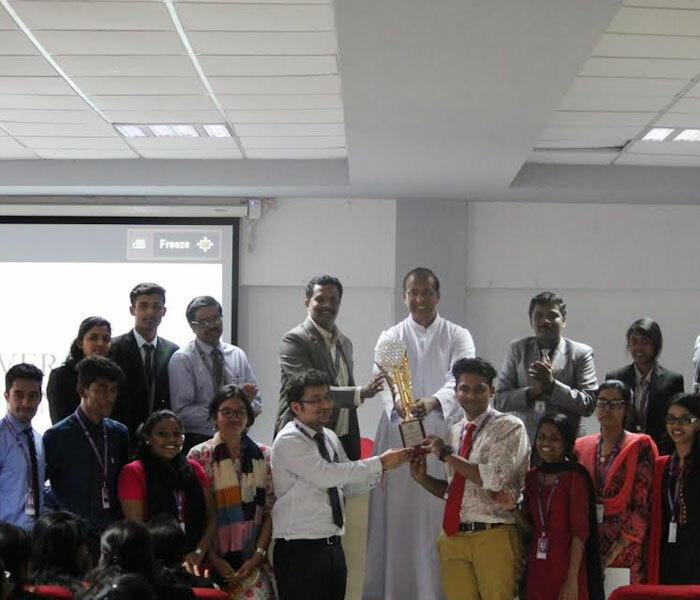 It was organised to provide an opportunity for students to showcase their talents by participating in debate session..
InQuizitive 2018, the first edition of Business Quiz competition organised by the Department of Management (BBA) ..
On 4th October 2018, UG final year and PG students of the Department of Life Sciences participated.. 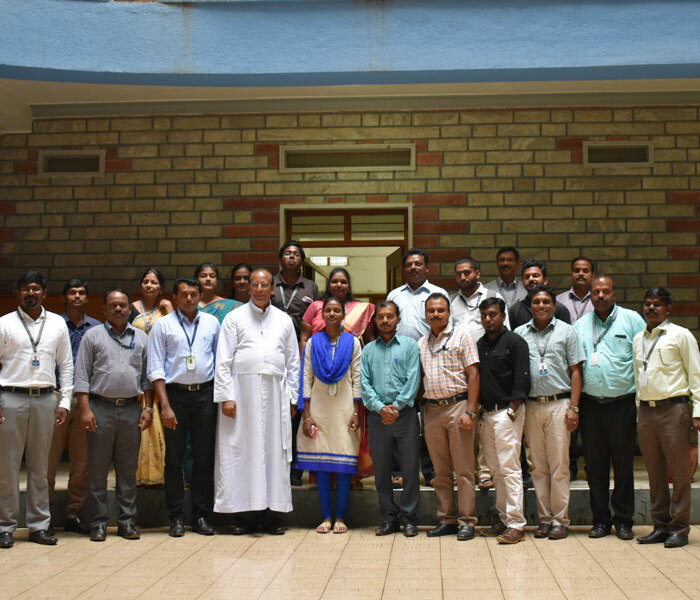 The Department of Social Work and Brothers Integrated Rural Development Society (BIRDS),.. 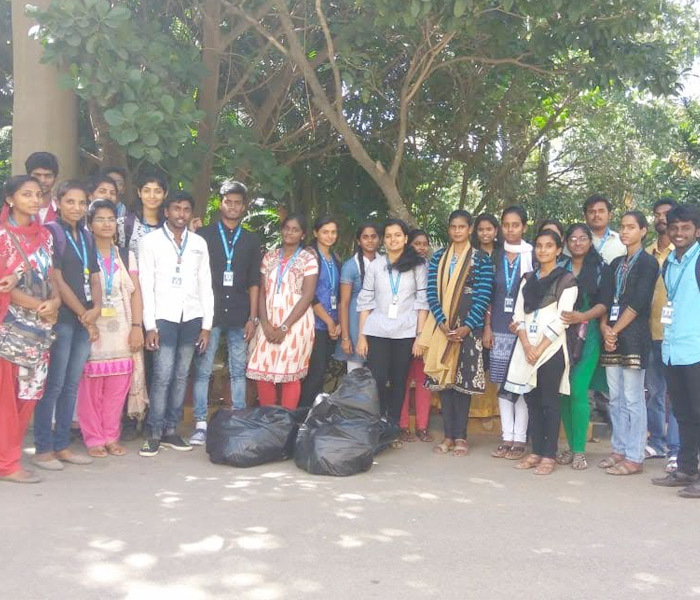 The Department of English (PG) at Kristu Jayanti College, organized a workshop titled “Art Reflections: Baroque to Neoclassical..
Centre for Social Activities of Kristu Jayanti College had organised Swachh Bharath -Swachh Campus on 2nd October 2018..
Bhavishyajyothi is a student initiative program of Kristu Jayanti College for the underprivileged, economically backward,.. 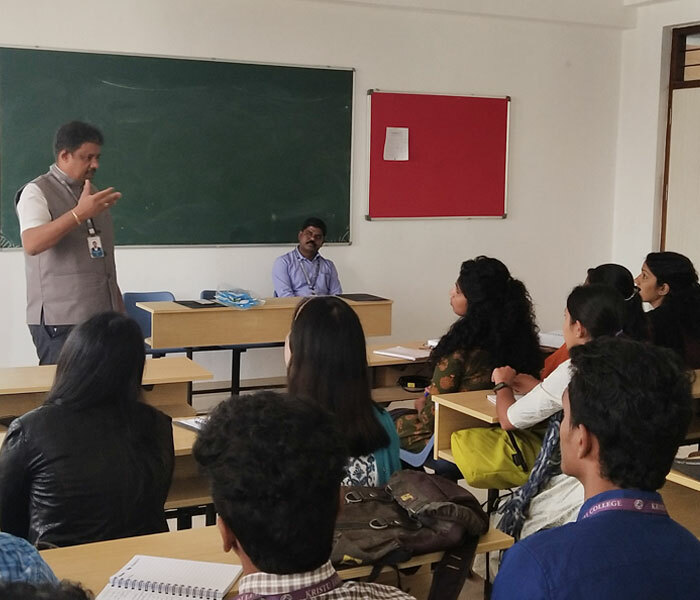 The resource person started the workshop with a theorizing session on the basics of Language and Scripts.. 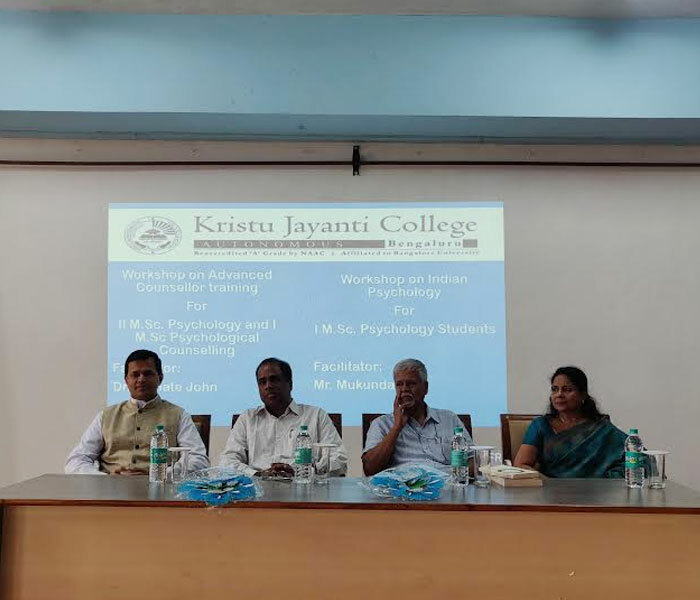 The Department of Economics, Kristu Jayanti College organized a two day national level workshop.. 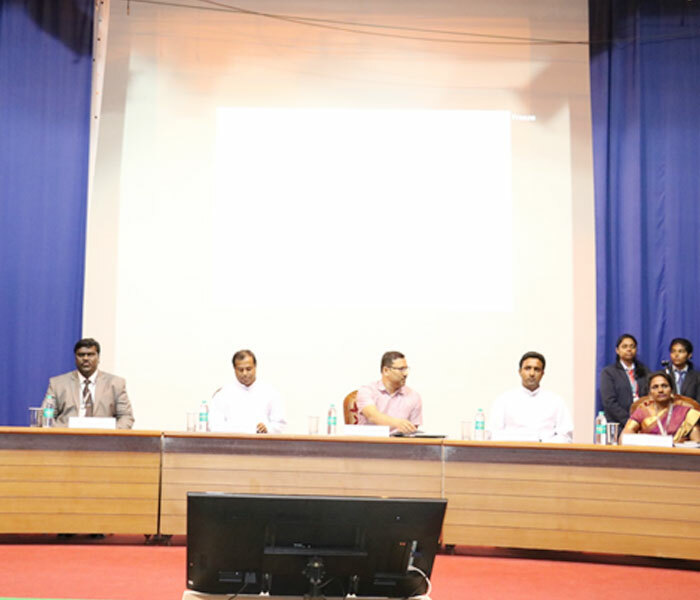 Aims to provide a platform to present and discuss the most recent innovations, trends, and concerns.. 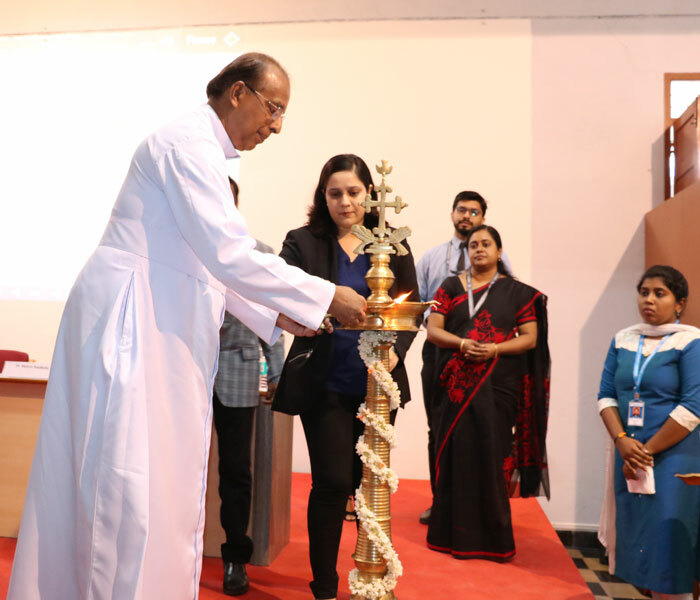 The art and craft exhibition was inaugurated on September 26th 2018 in Mini Audi-I.. 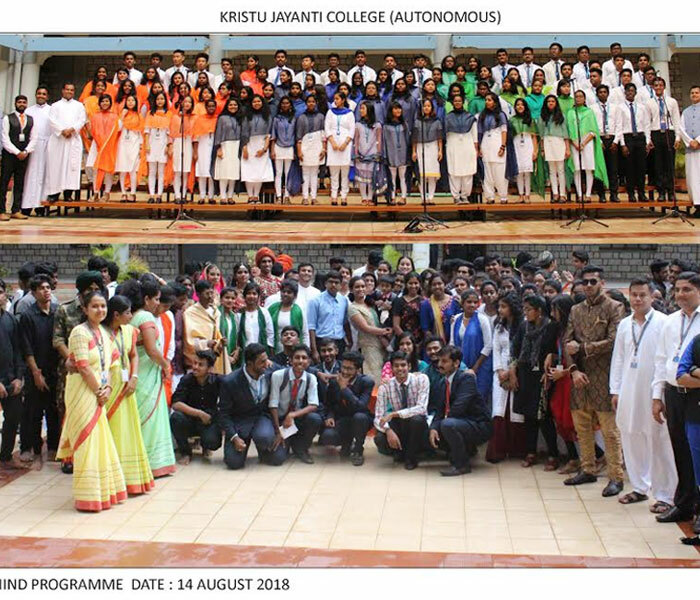 The Department of Management (BBA) of Kristu Jayanti College organized the second edition of its intra collegiate Service..
On September 25th, 2018, the students of III Semester B.Sc. 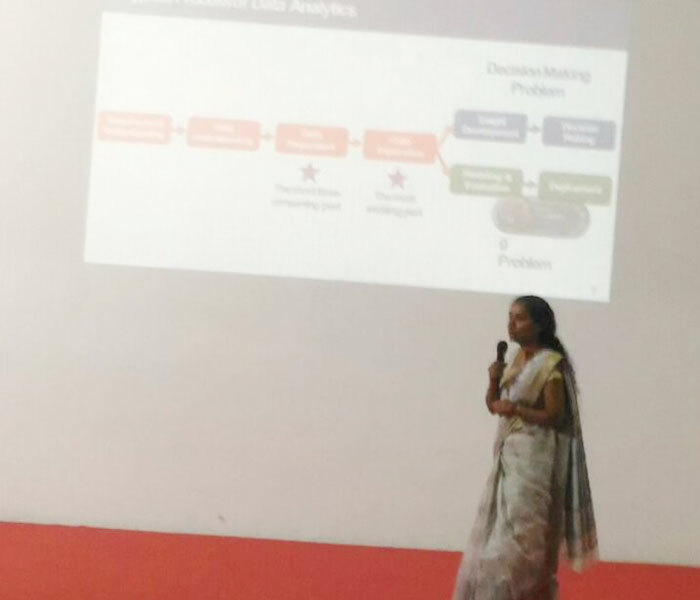 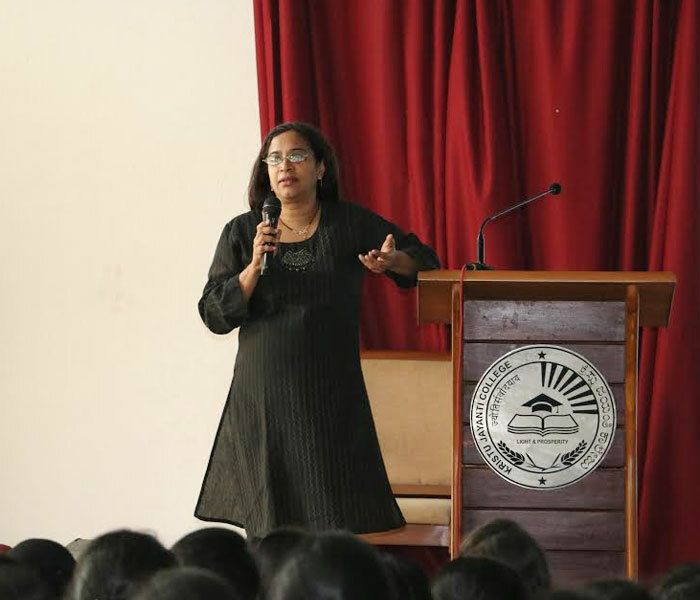 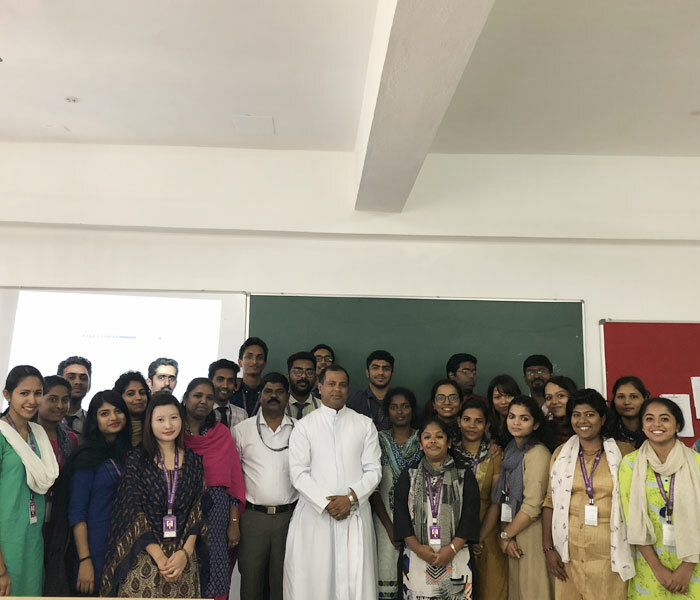 Biotechnology (BBG), visited Holy Cross..
Dr. Arti Singh spoke about overview of stock market globally, listing procedure, speculators in stock market and London.. 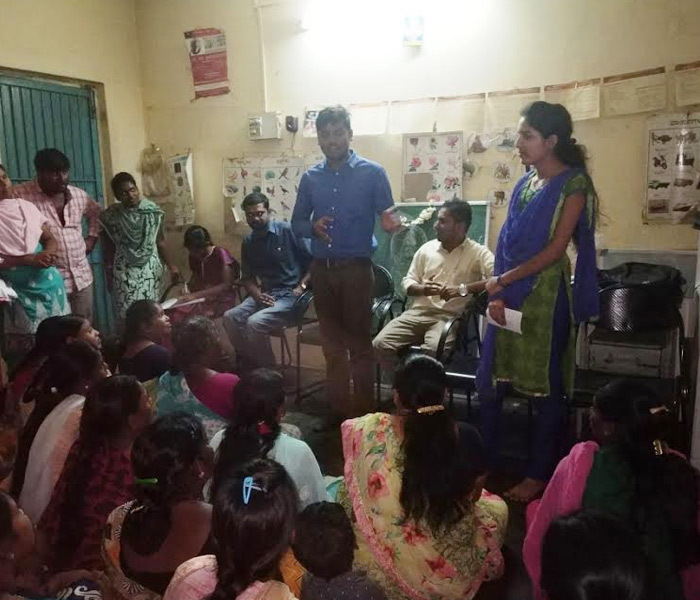 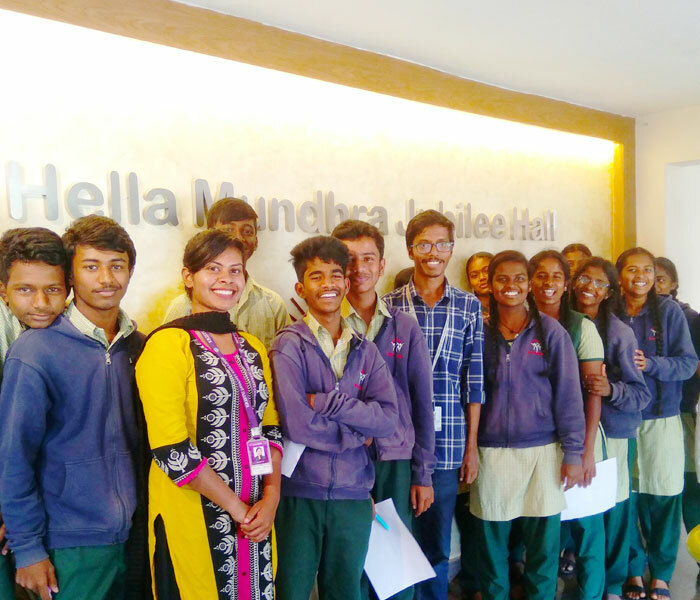 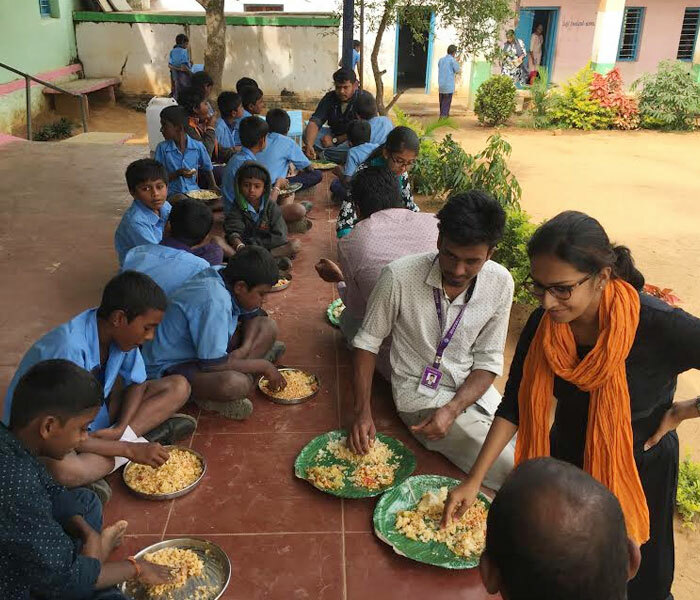 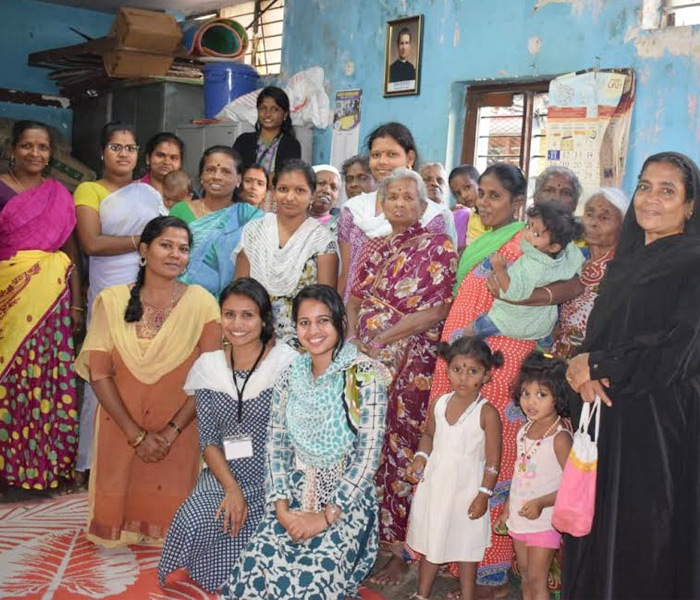 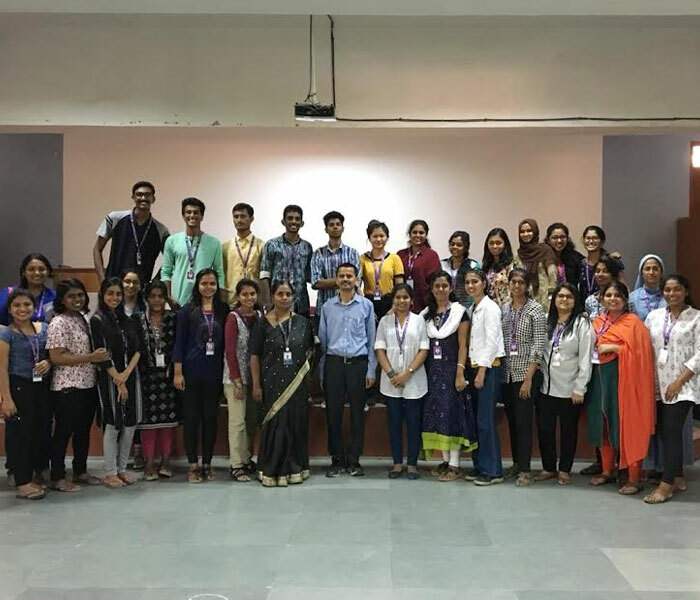 The III Semester B.Sc, Microbiology (MBG) students visited Guanella Preethi Nivas old age home, Geddalahalli, Bengaluru..
PG Students of Life Sciences Department visited Alamba Charitable Trust, Gubbi Cross..
Department Of Psychology had organized a workshop on Solution Focused Breif Therapy on 22nd of September.. 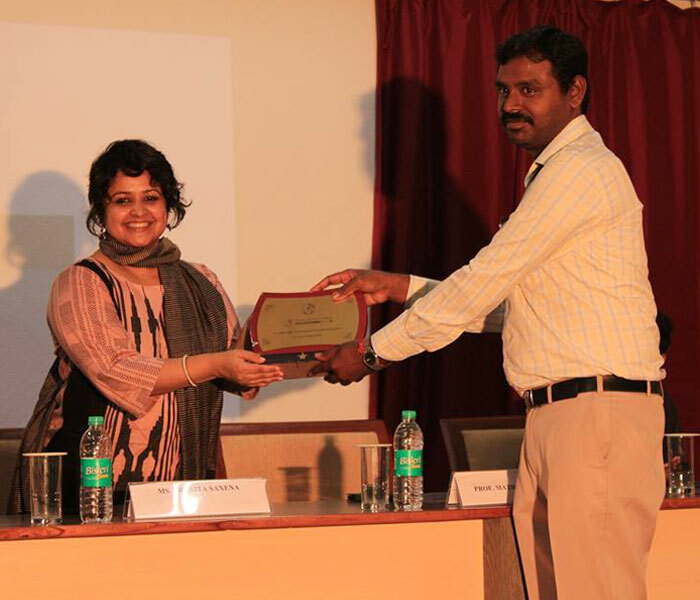 The Department of Social Work in collaboration with Childline India Foundation and Bangalore..
Department of Psychology of Kristu Jayanti College organised the fourth National level inter-collegiate..
We were delighted to have in our midst Ms. Anna Isaac of the 'News Minute' - a Bengaluru-based digital news house.. 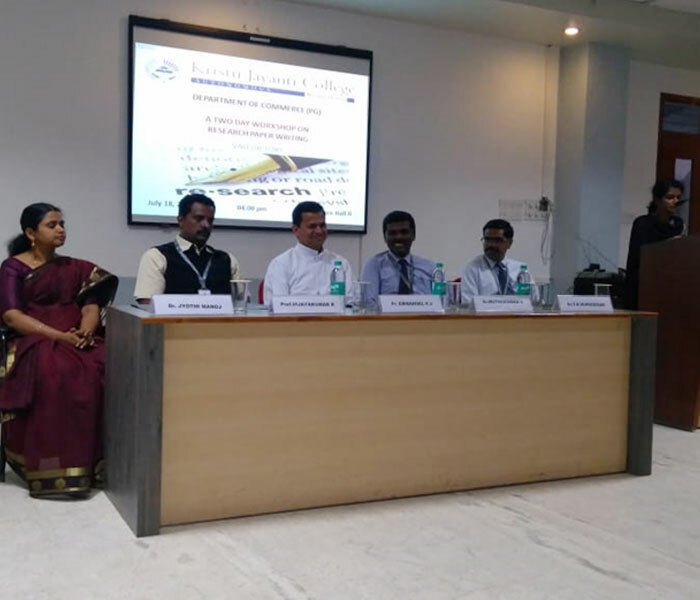 The two days’ workshop on Advanced Skills Training in Counseling was held on 11th and 12th.. 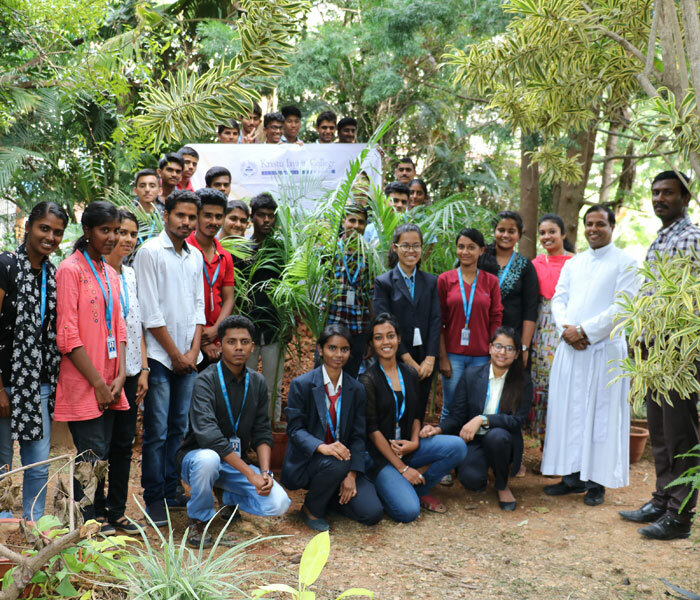 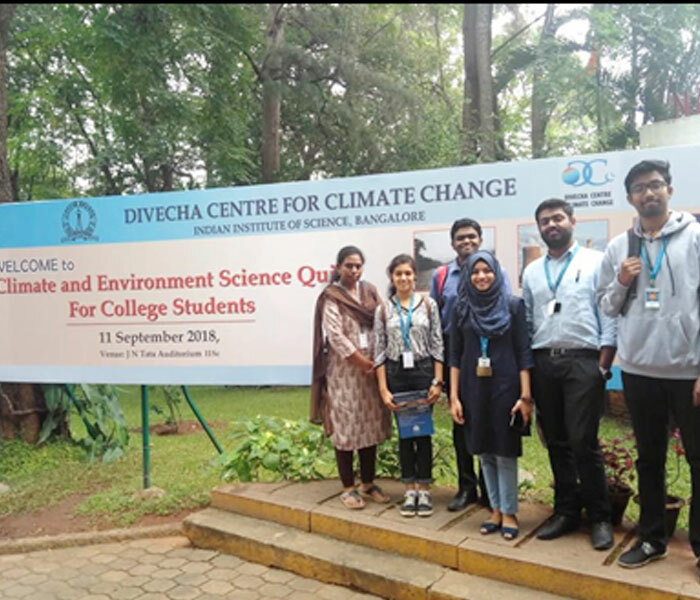 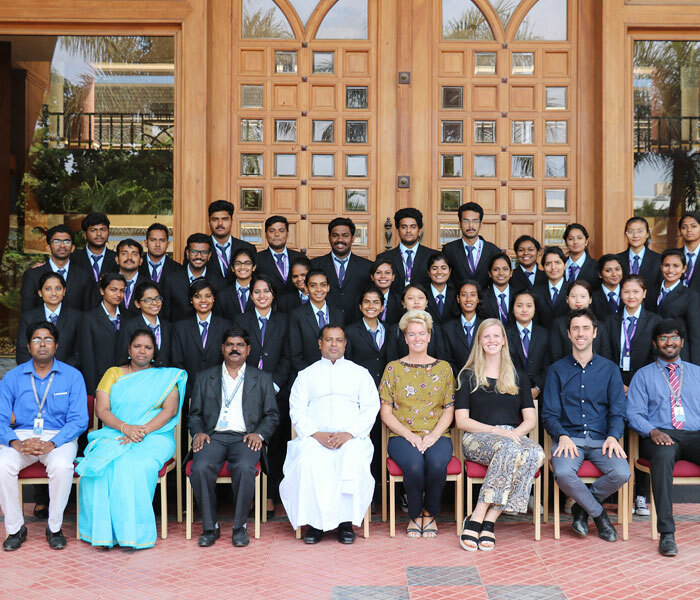 The UG students of Life Sciences Department attended the Climate Change and Environment Quiz held at IISC..
On September 11th, 2018, Department of Psychology conducted a 1-day workshop on Indian Psychology..
Vignanamanthan focused on the Hardware and Software Co-design on New-Generation.. 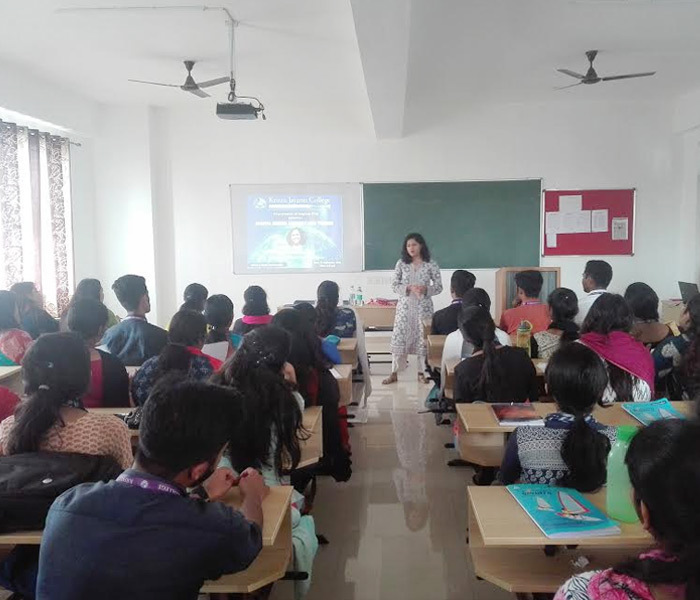 The M.Com students from the Department of Commerce PG, Kristu Jayanti College conducted one-day workshop ..
Social Outreach Programmebr/> We had a great time spending the evening with the children who were very well at showcasing their..
Mr. K. Kiran Kumar delivered lecture on live trading in Indian stock market on the following topics..
Centre for Social Activities of Kristu Jayanti College had organized “VAN-MOHOTSAVA”.. 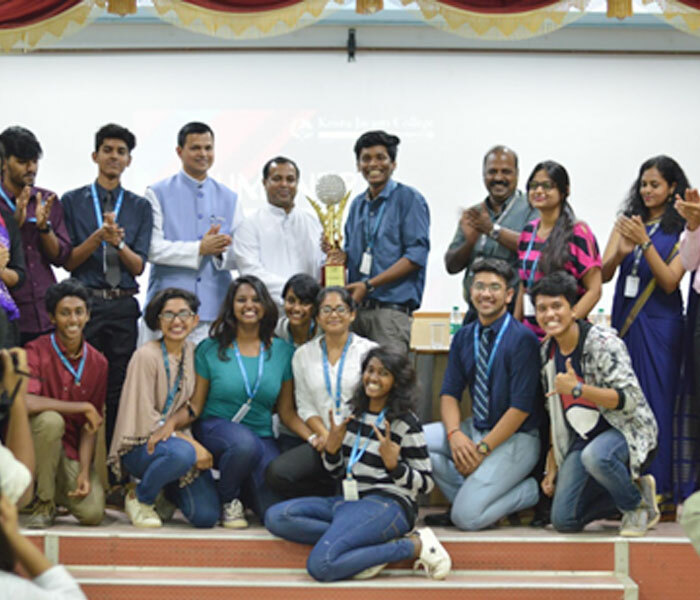 Impulse 2K18, Intra-Collegiate Fest conducted by Department of Commerce (PG),.. 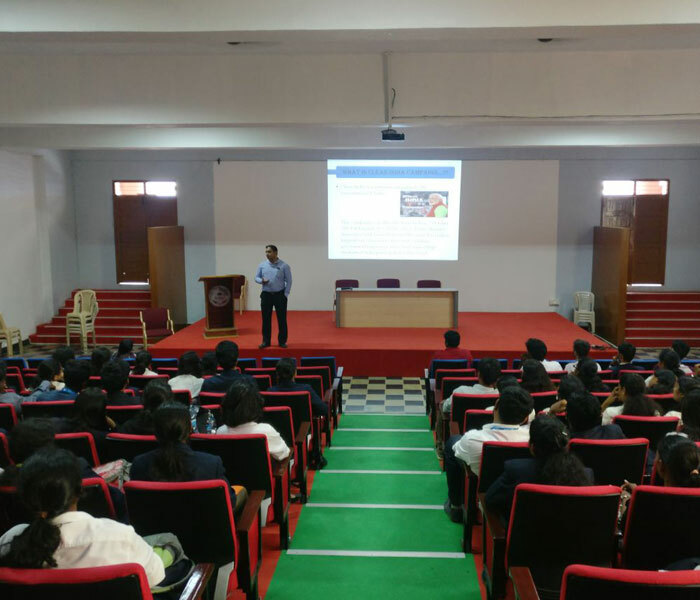 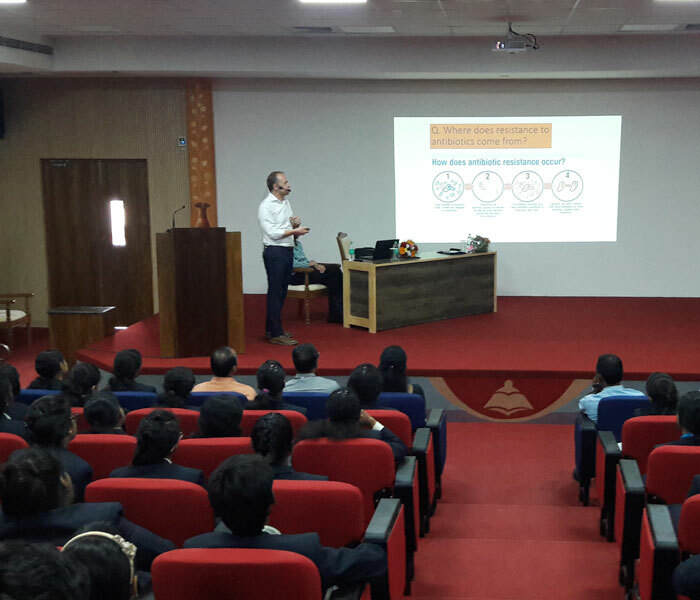 The Department of Life sciences organized a Guest Lecture on “Science and Career” on 24th August 2018..
To understand how to sell and buy a stock in stock market through Live Trading.. 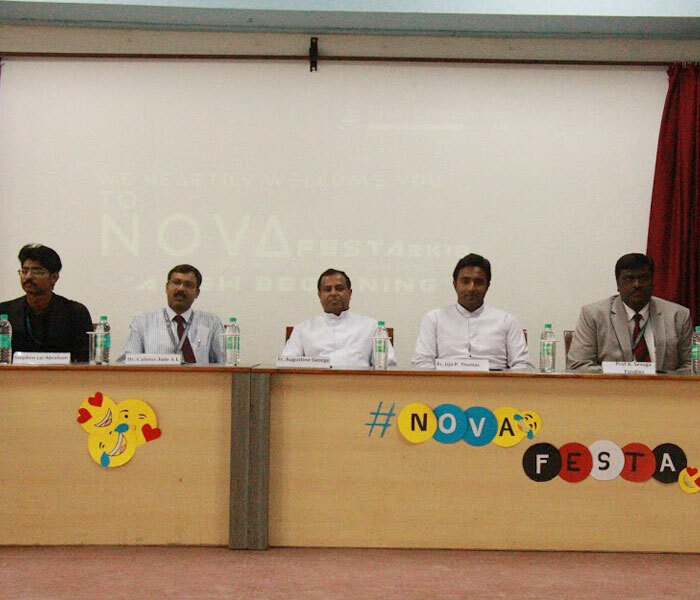 The 7th Annual Intra-collegiate psychology fest was organized by the Department of Psychology to inculcate.. 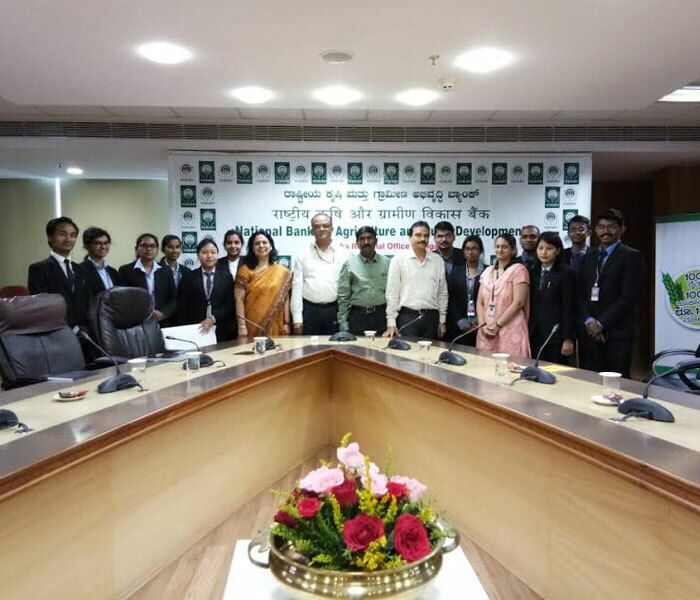 The Students of 1st and 2nd year MA Economics visited the NABARD Karnataka Regional Office..
Key events in the fest were Quiz, Cases Study, Investigation and Debate. 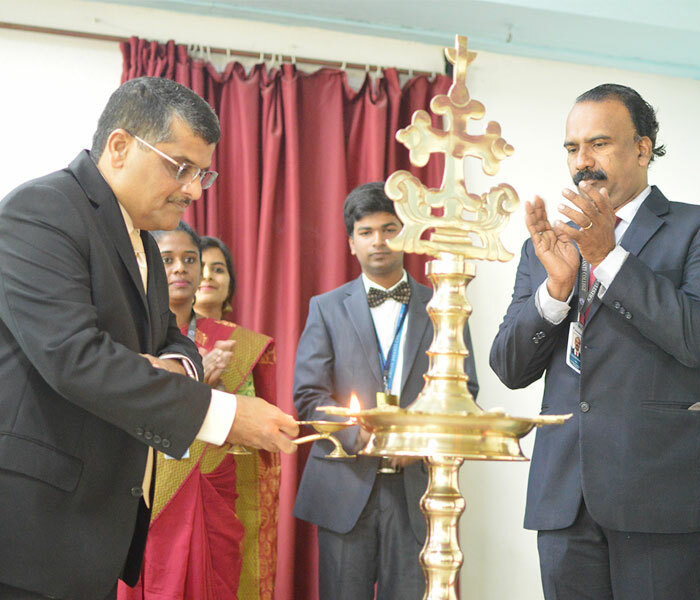 The Chief Guest for the inauguration..
Kumara Indrabetta was the chief guest of the day accompanied by Prof. Venkateshappa and Dr. Sarvesh.. 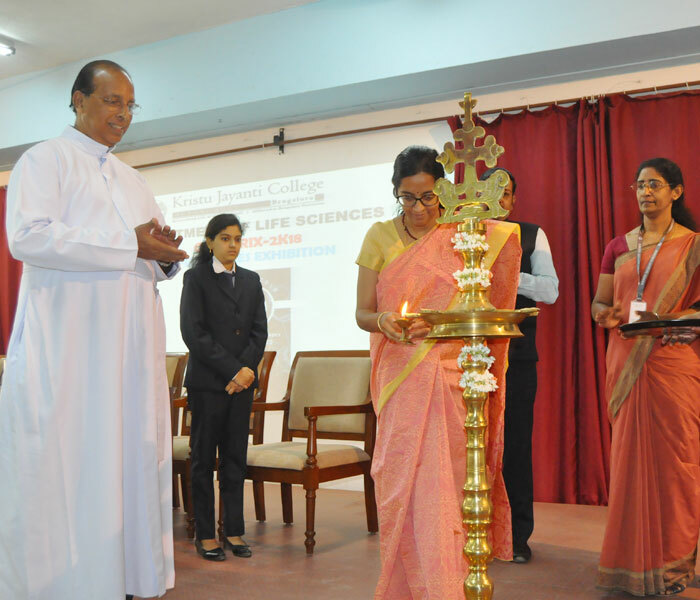 The Life Sciences Department of Kristu Jayanti College organised Connoisseur 2018.. 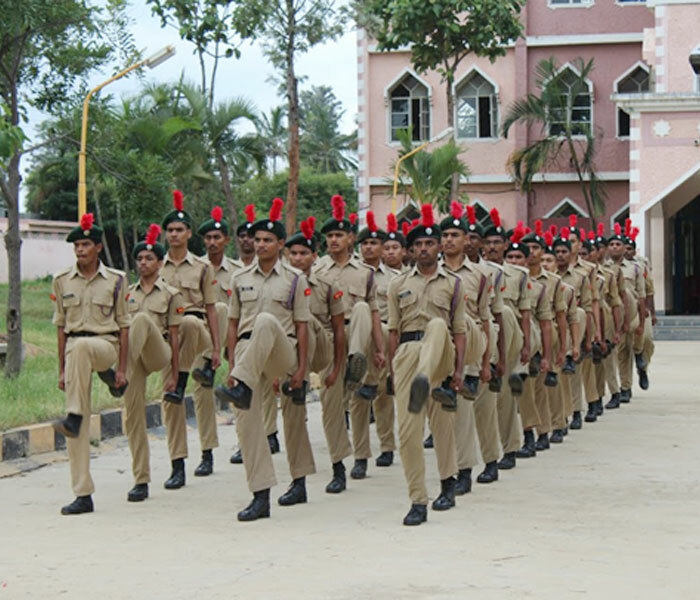 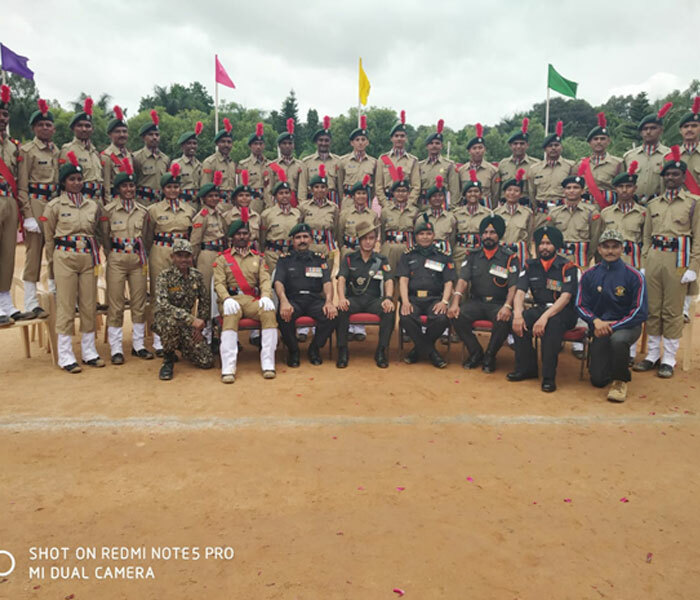 It was a great privilege for NCC Cadets from Kristu Jayanti College to participate in the CM’s state Independence Day ..
Center for Social Activities of Kristu Jayanti College visited an Orphanage “HOME OF HOPE”..
Department of Commerce, Kristu Jayanti College (Autonomous), had organized “Jai Hind 2018” on 14 August 2018.. 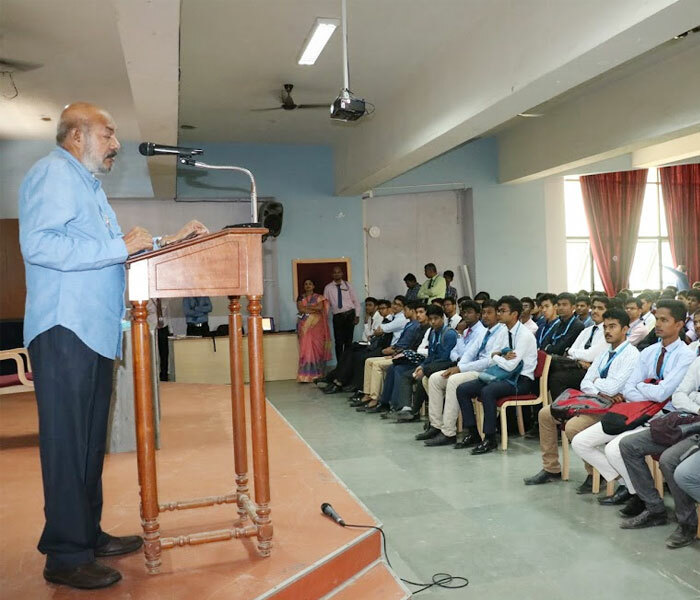 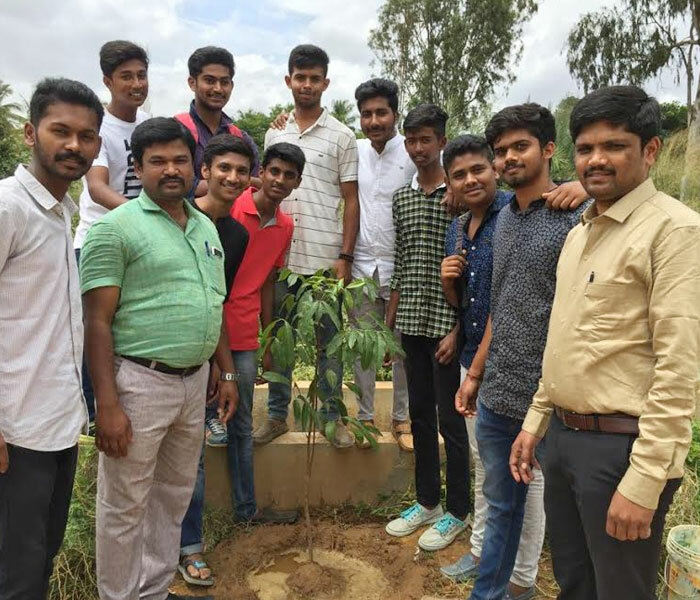 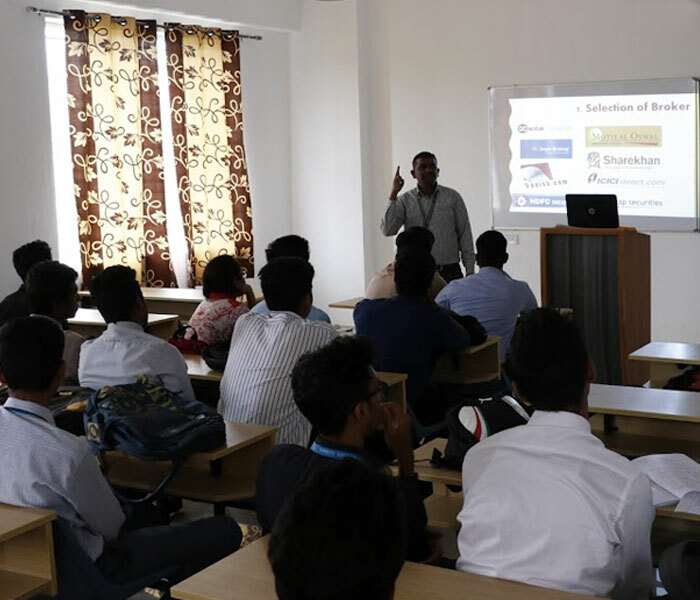 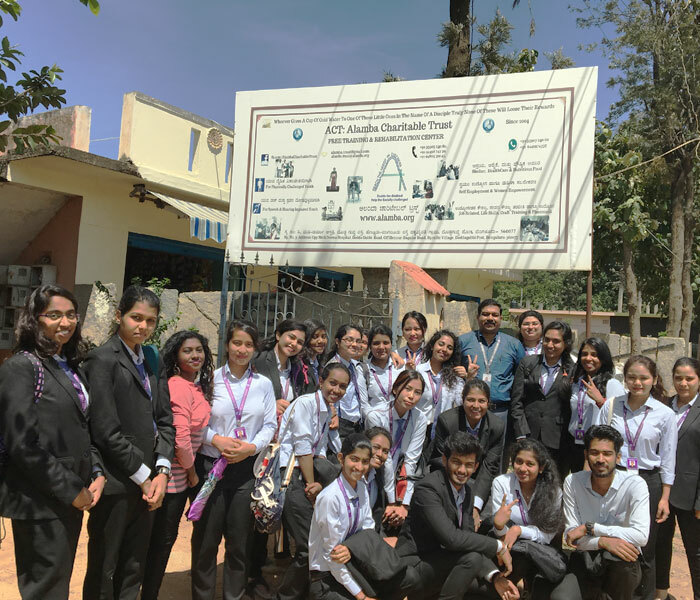 The Department of Management (BBA) organized the annual intra collegiate management fest - Acumen’18..
Kannada students Around 80 students visited Janapada Loka, Ramnagar on 11 August 2018..
SYNCHRONIZE 2K18 is an intra-collegiate IT fest organized by the Computer Academy- the auspicious..
Chief Guest of the Programme was Dr.Hulikal nataraj, Famous miracle buster, Doddaballapura.. 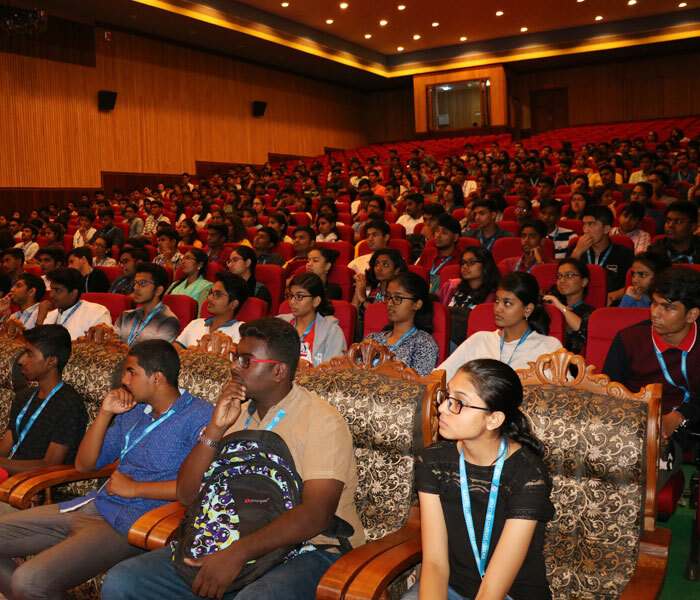 The film club of Kristu Jayanti College in association with Department of Journalism and Mass Communication organized a two-day.. 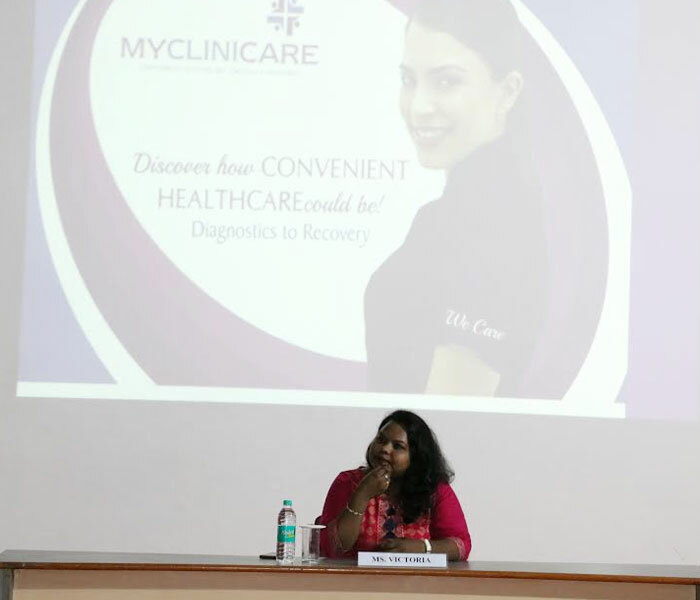 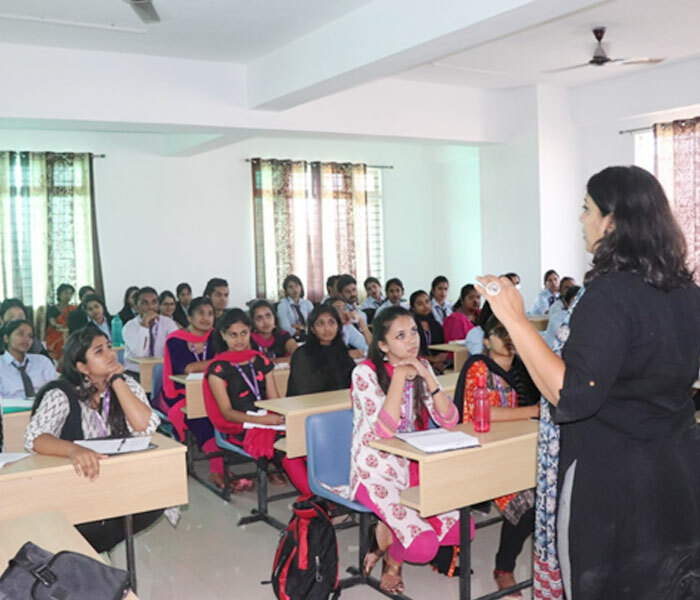 The Women Empowerment Cell of our College organised a Guest lecture on “Personal Health and well-being .. 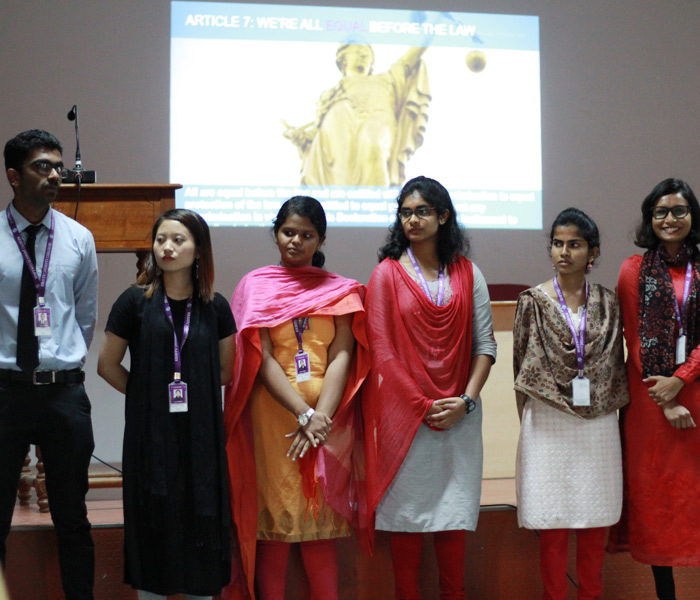 The Women Empowerment Cell of our College in association with Department of Social work Organizes.. 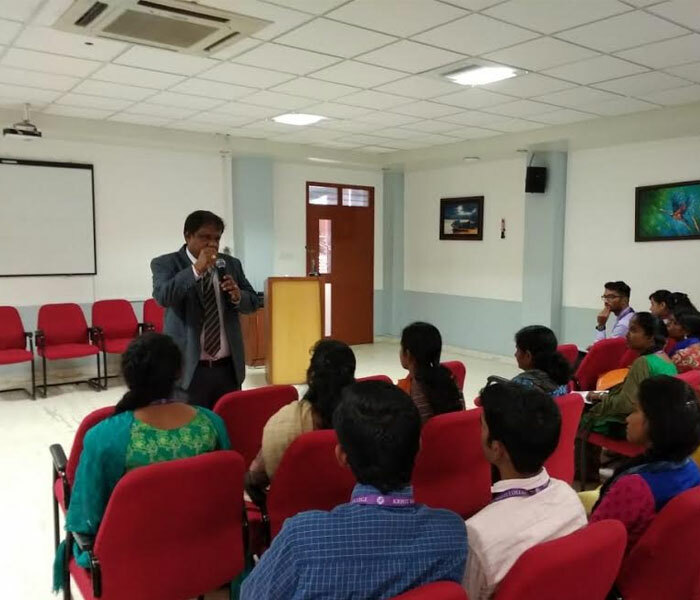 The skills can be portrayed in the linguistic spontaneity, intellectual sharpness of personality and creative activities..
On August 4, 2018 Department of Economics was honored and pleased to organize a workshop .. 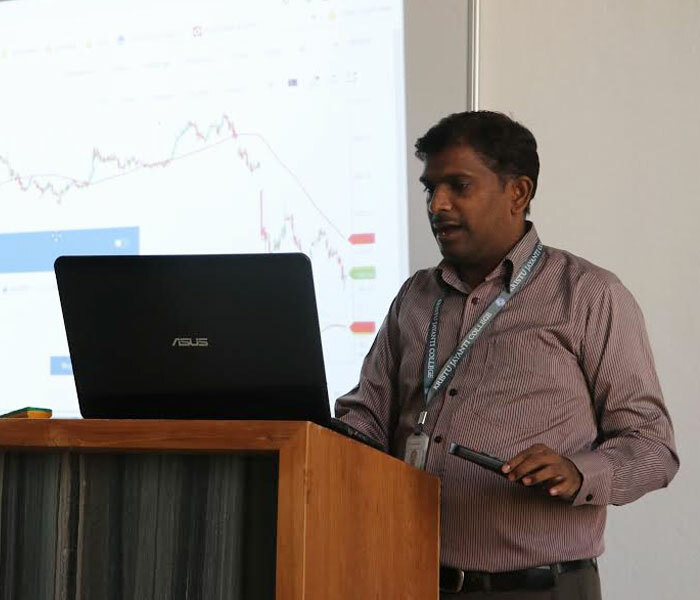 The Department of Social Work organised a Social Innovation Lecture on Health: A Human Rights..
Mr. K. Kiran Kumar focused his session on overview of Stock Market and current trends in capital markets .. 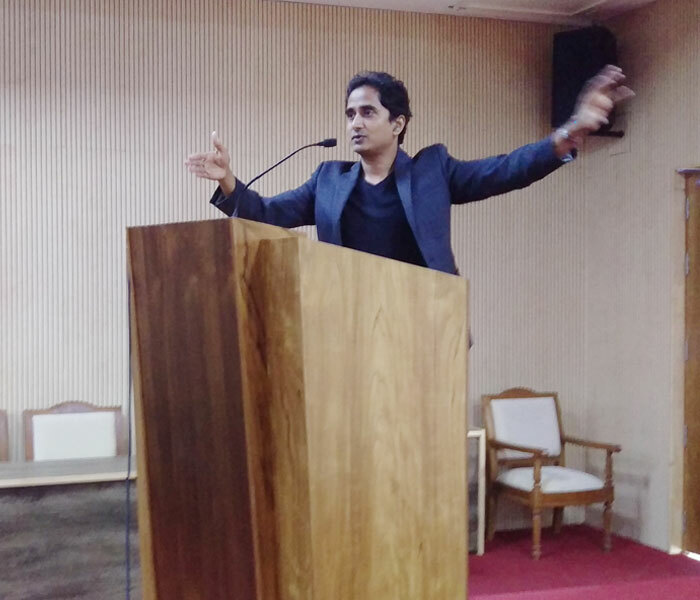 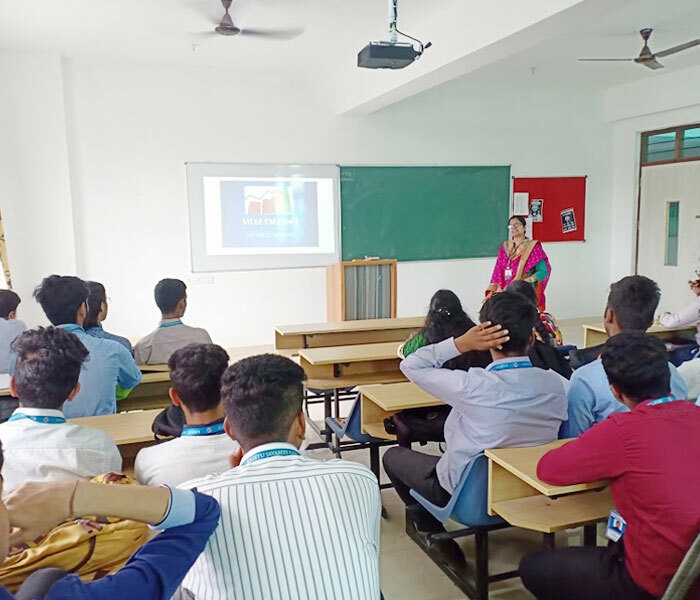 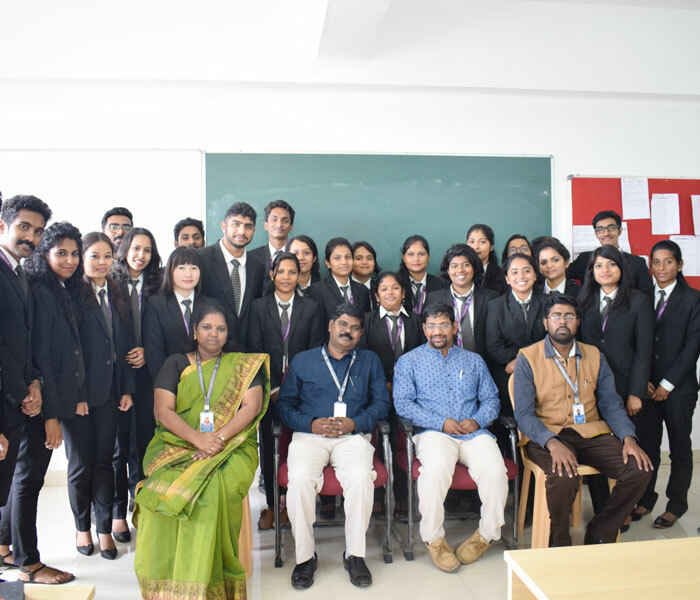 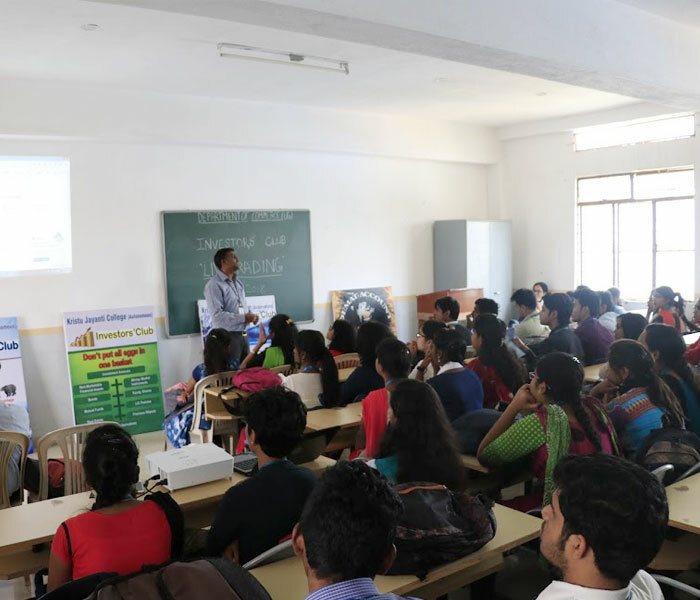 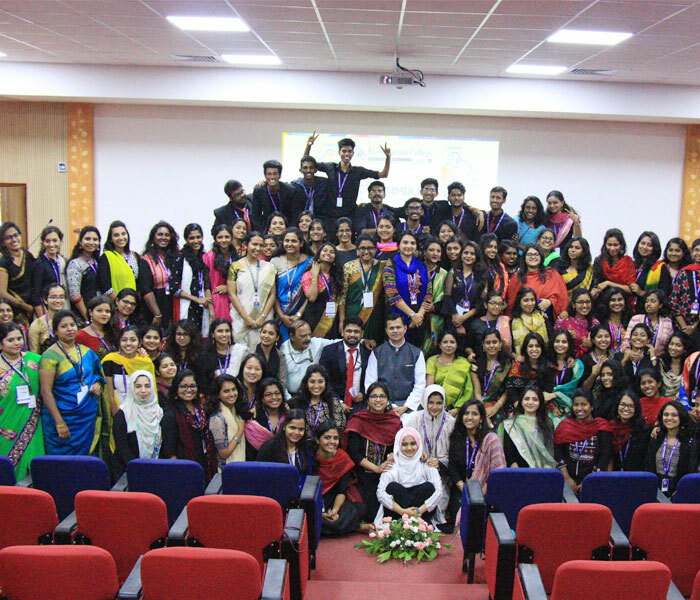 The Department of Political science, Kristu Jayanti College, Bangalore organised an educational tour to New Delhi to attend..
Second year MA economics students addressed the V BA HEP students with different topics such .. 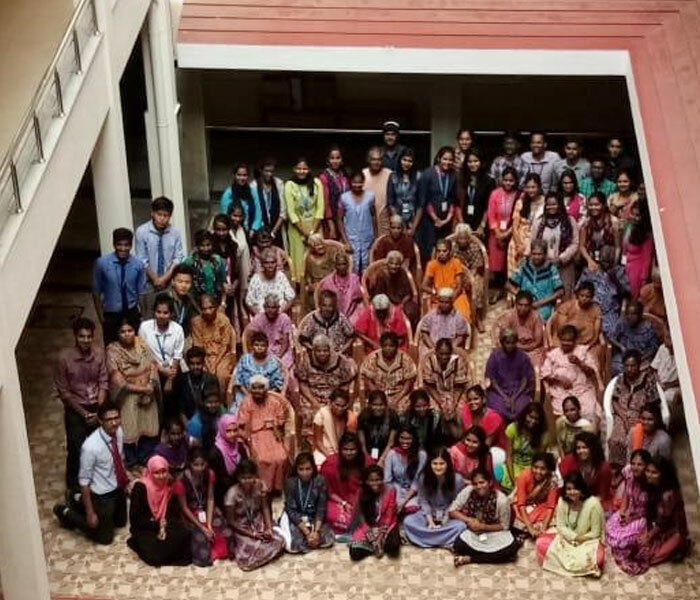 The Department of Computer Science (UG) celebrated freshers Day 2k18, (NOVA FESTA) on 30.07.18 at 3:00 ..
Three days life skill education for the I Year M.Com, M.Com FA and M.A Economics Students.. 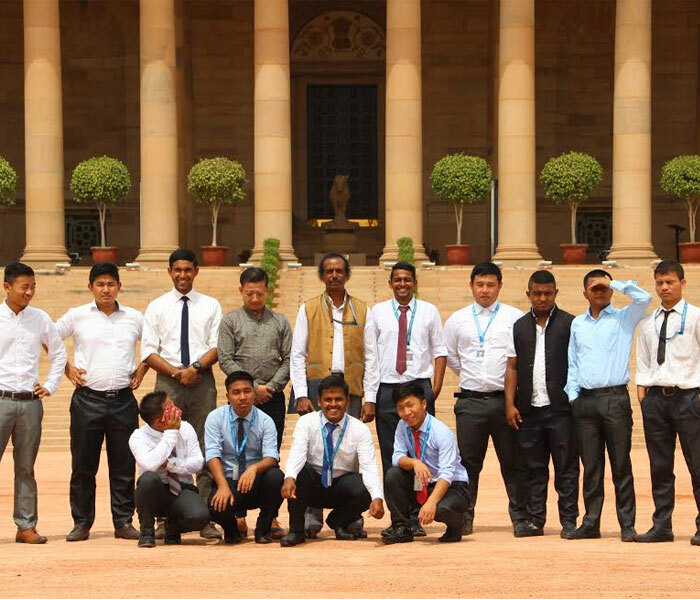 The objective of the Vichaarmanthan is to introduce the students to the various aspects of leadership through interaction.. 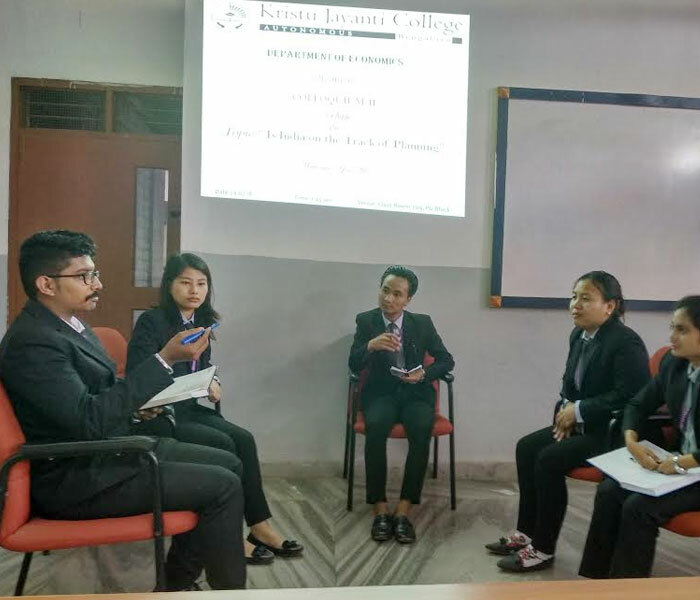 The NCC cadets of Kristu Jayanti College attended the Combined Annual Training Camp (CATC VI)..
Department of Economics conducted Student Colloquium-2: DEBATE on “IS INDIA ON THE TRACK OF PLANNING..
Department of Psychology had sent the final year M.Sc. 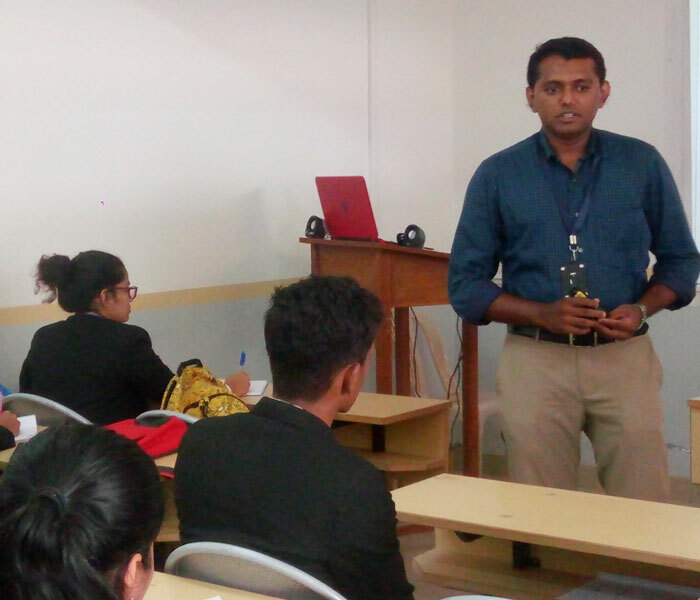 Psychology students (Counselling and Industrial Specialization)..
Department of Psychology had organized a 2 day workshop on “Applied Behavioural Analysis” for the final year M.Sc. 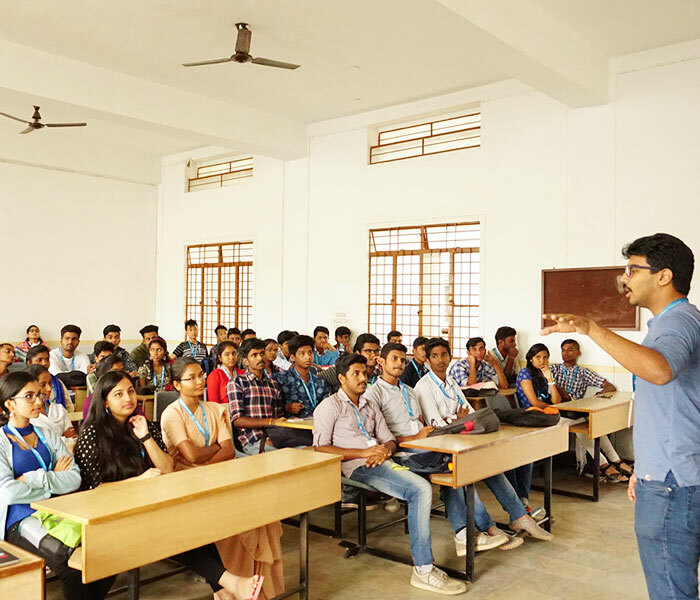 Psychology.. 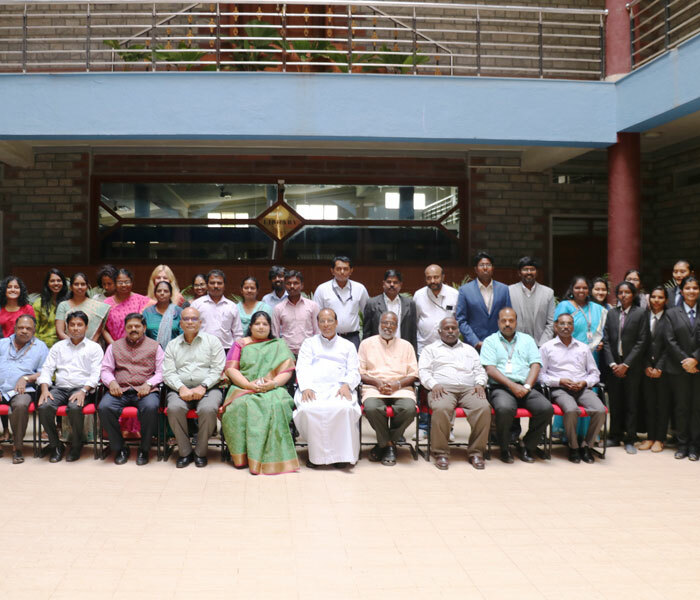 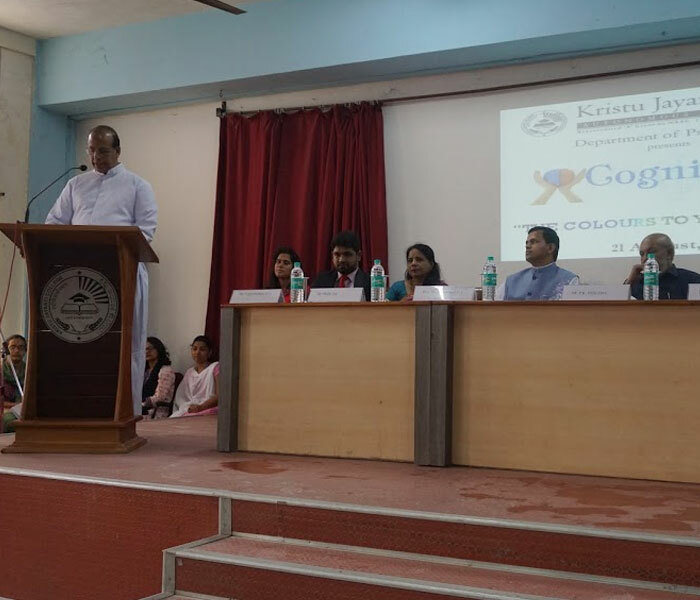 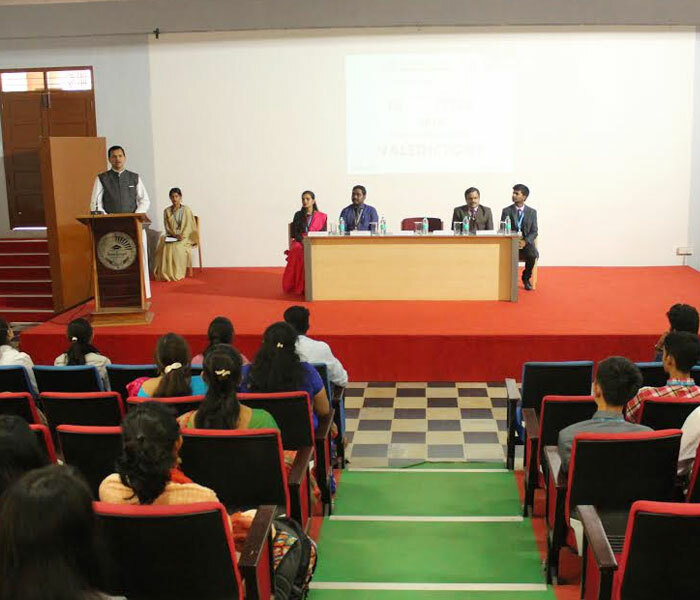 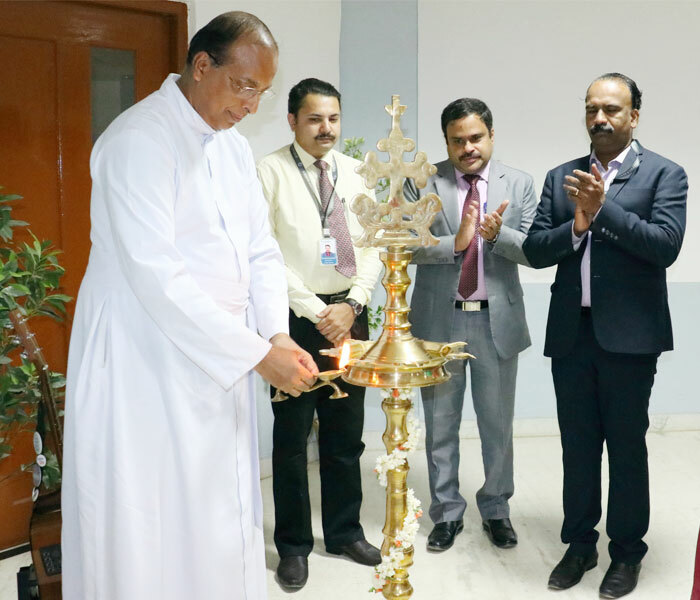 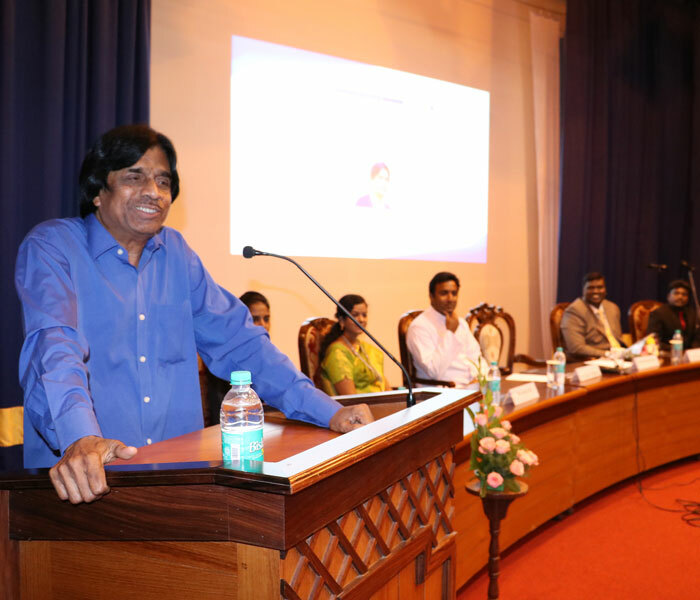 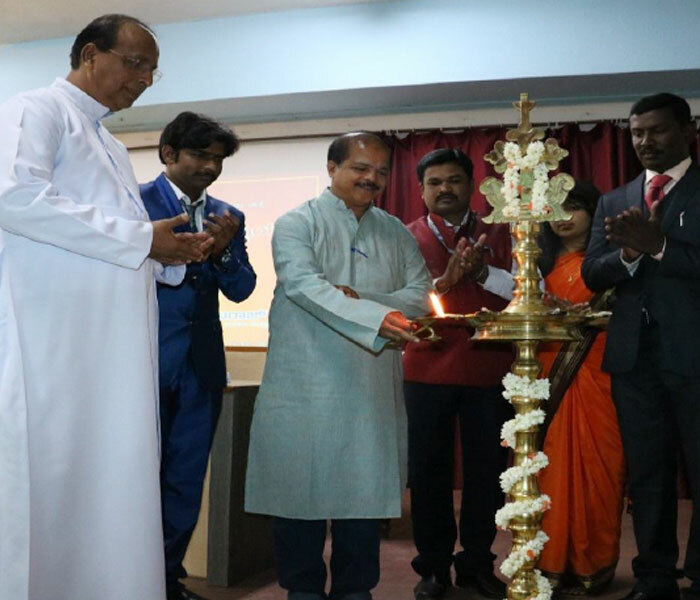 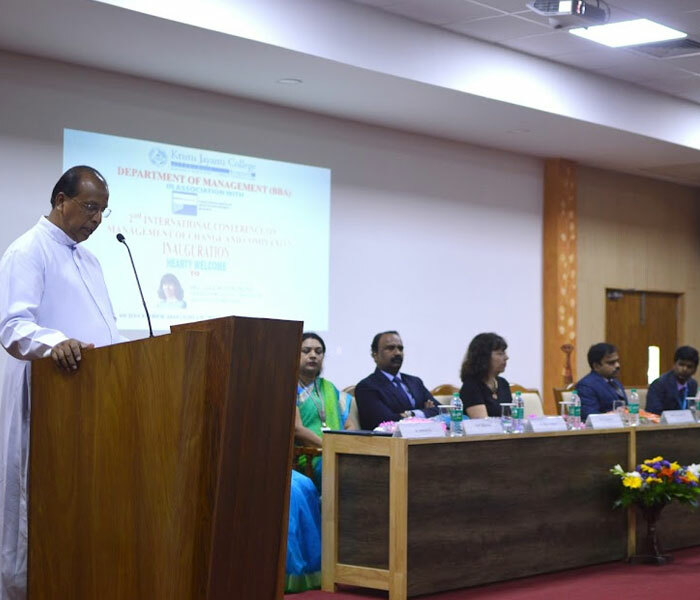 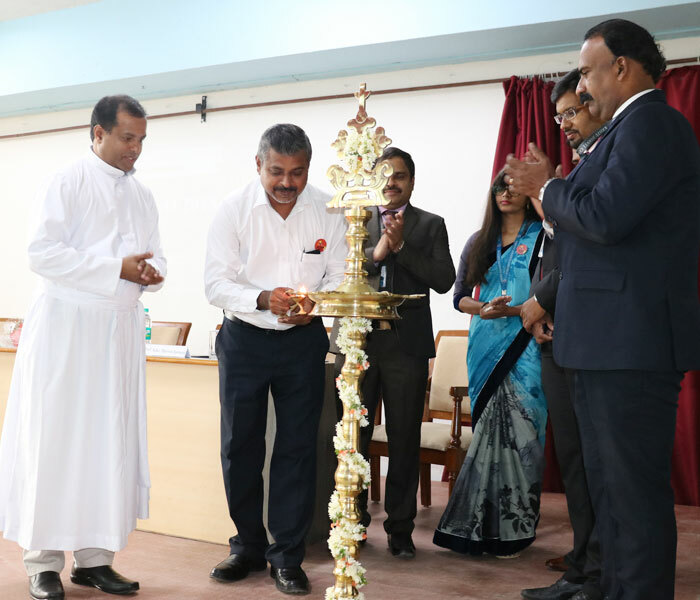 The Inauguration “One year Post Graduate Diploma Courses for Working Executives” offered by Department of Management..
ACM-W Student chapter, Department of Computer Science(UG), organized a workshop on interactive web design.. 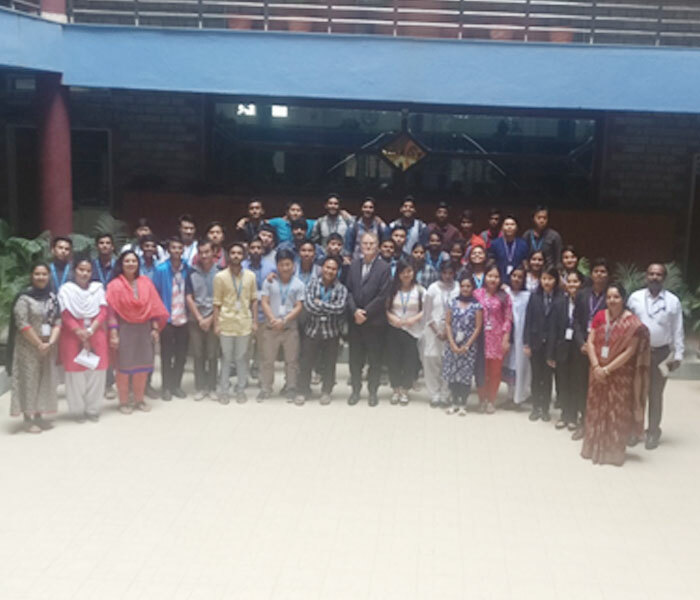 The final year students of BCA and BSc were the resource people. 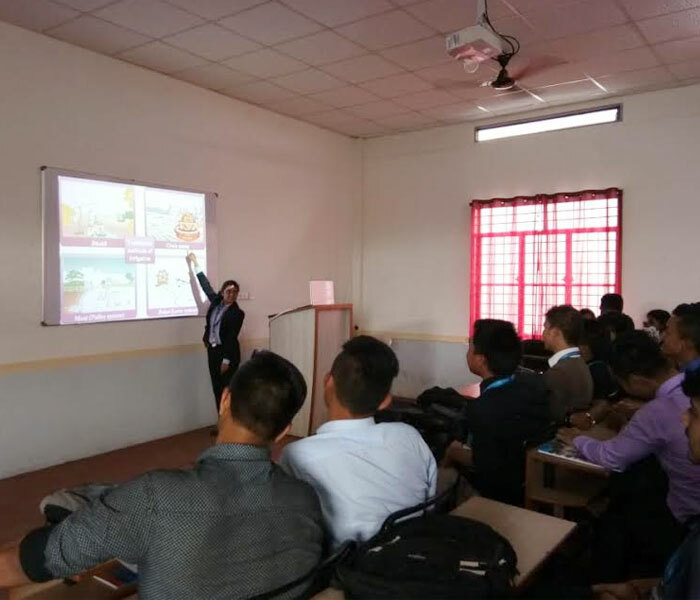 They gave a motivating and energetic session.. 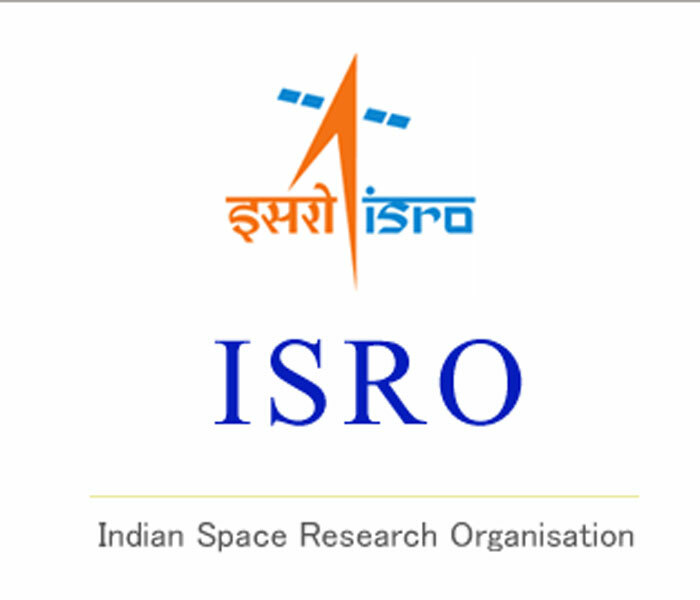 There are many interesting revelations of History when one study coins of an age. 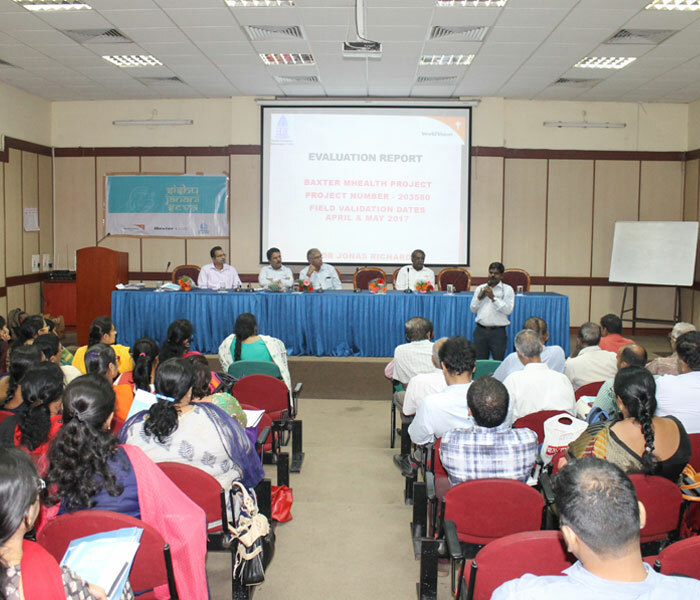 Numismatics confirms..
Research not only generates useful insight and confidence but also acts as a stimulant.. 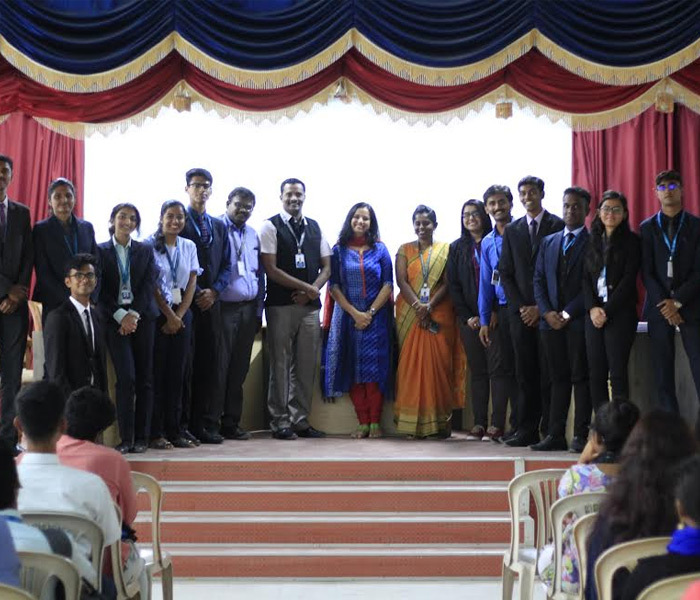 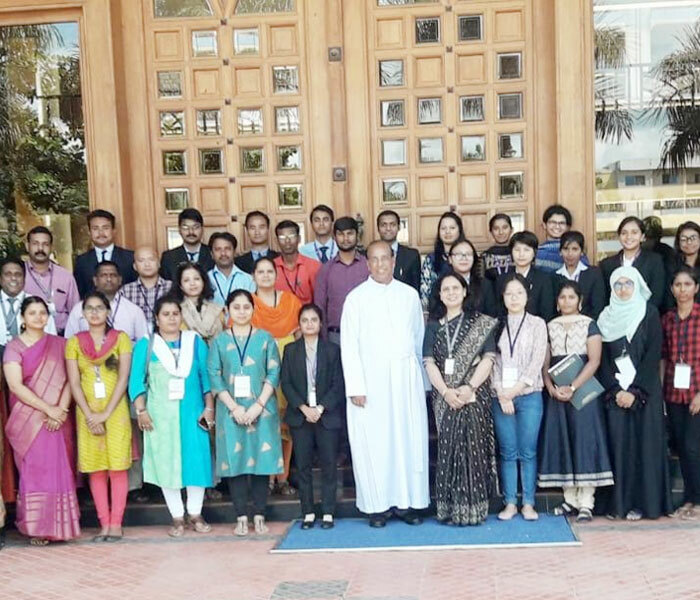 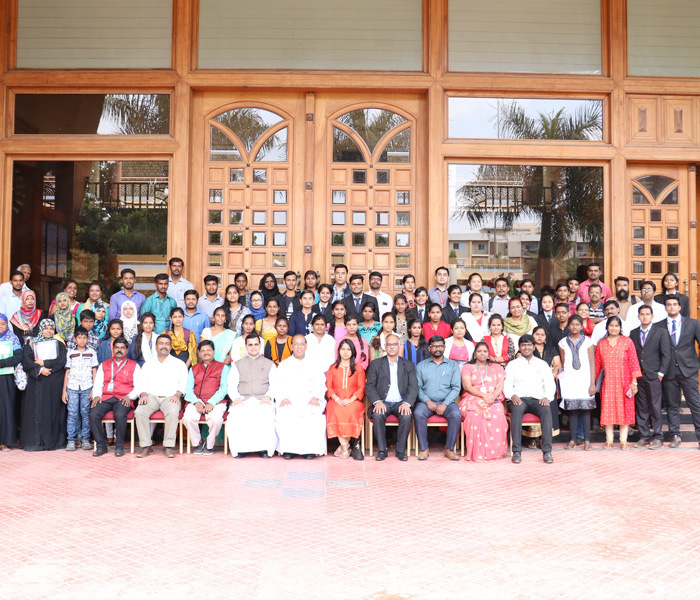 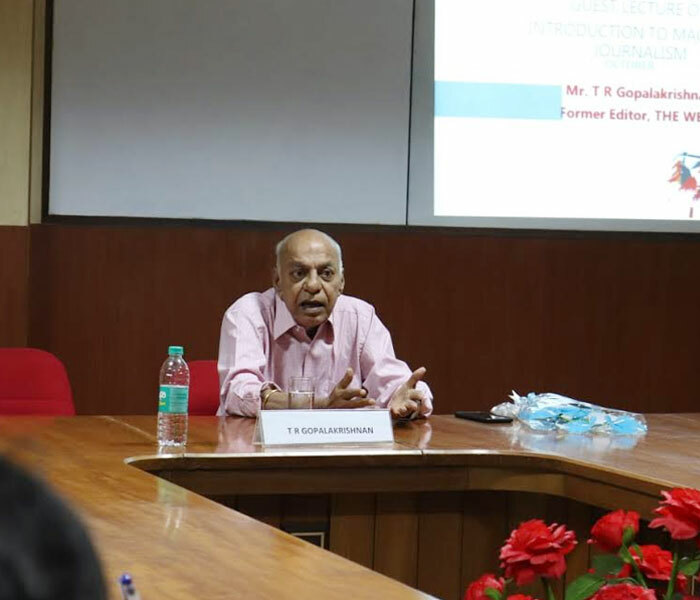 The students of fifth semester BCA and BSc (CSMS/CSME) accompanied by four faculty members visited ISRO..
Department of Journalism and Mass Communication, Kristu Jayanti College, Bengaluru organized a niche workshop .. 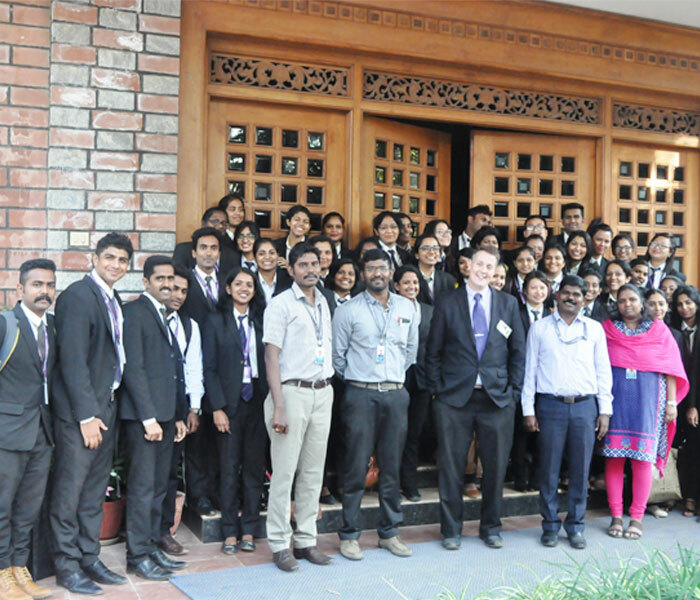 The Department of Social Work in association with the Centre for Employability and Corporate Relations (CECR).. 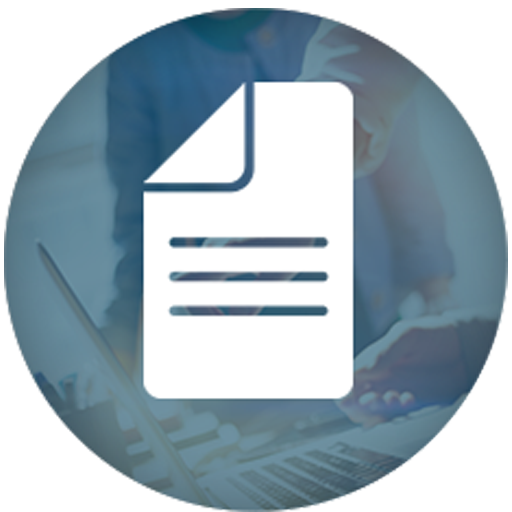 When many of us were in our teens, summer projects and work for science fairs meant visit to a photocopier.. 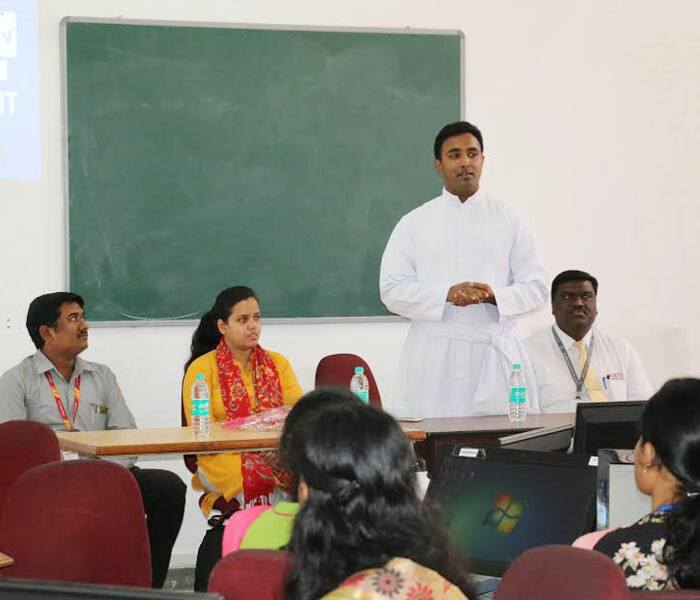 The Women Empowerment Cell of our college organized an awareness programme on BREAST CANCER,.. 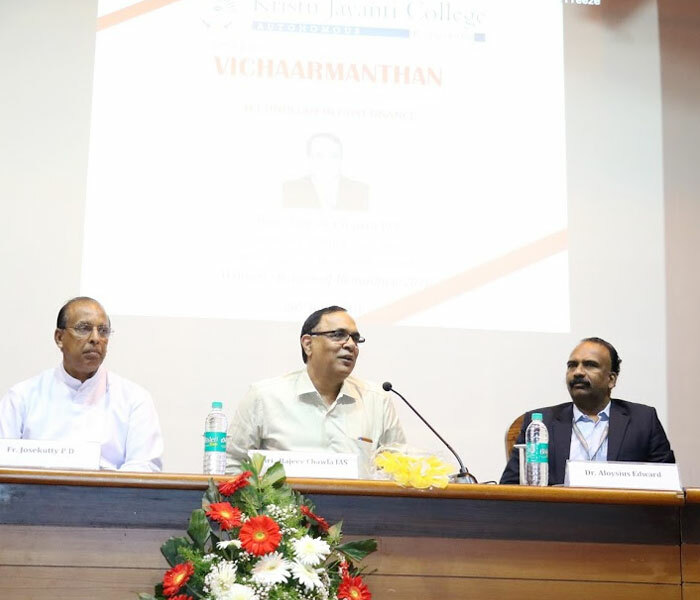 Global Competitive environment today requires resilient individuals who are dynamic .. 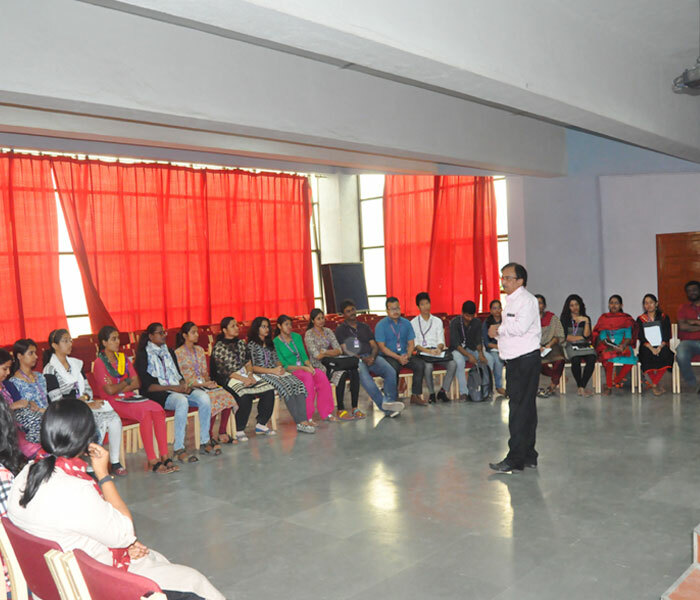 The Department of Management (BBA) organized VIRTUOSO’18- a management workshop headed by the final year students ..
Department of Management │ MEET YOUR ALUMNI- "Significance of Participation in Academic Activities"
The department has organised ‘Meet Your Alumni’ on 7th July, 2018 as part of interaction between students and alumni..
Ms. Latha gave an introductory description on SAP (System Applications and Products). 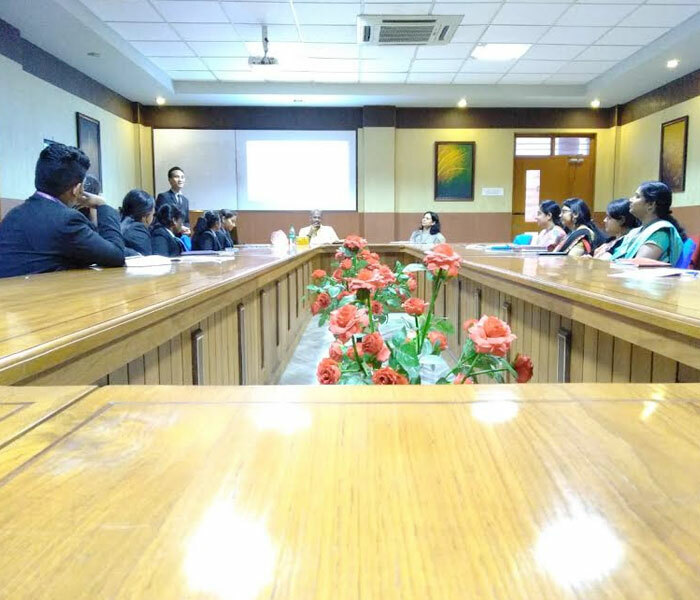 She emphasized..
To impart knowledge on Data analytics and to create solutions to real world business problems, communicate findings..
Group Discussion on “World Cup-Will it reinvigorate Russia’s stagnating sectors of the economy with an influx of foreign visitors and spending”.. 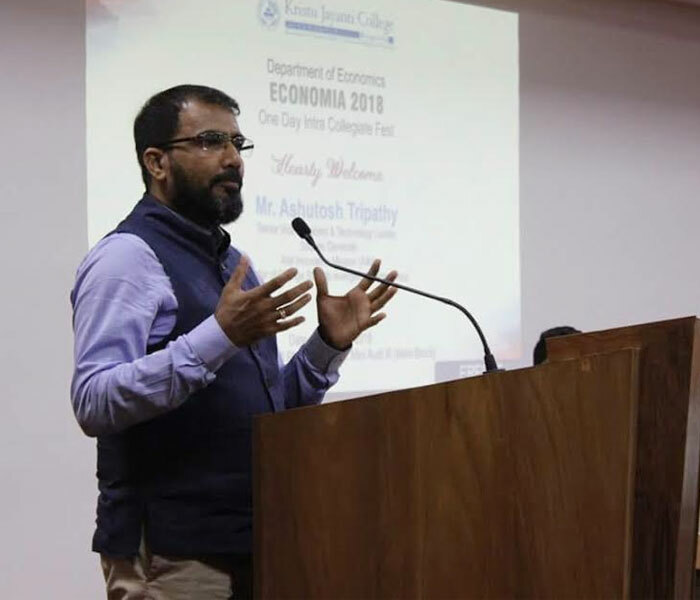 Classical economics, which dominated in the 18th and early 19th centuries, laid the foundation for much of modern economics.. 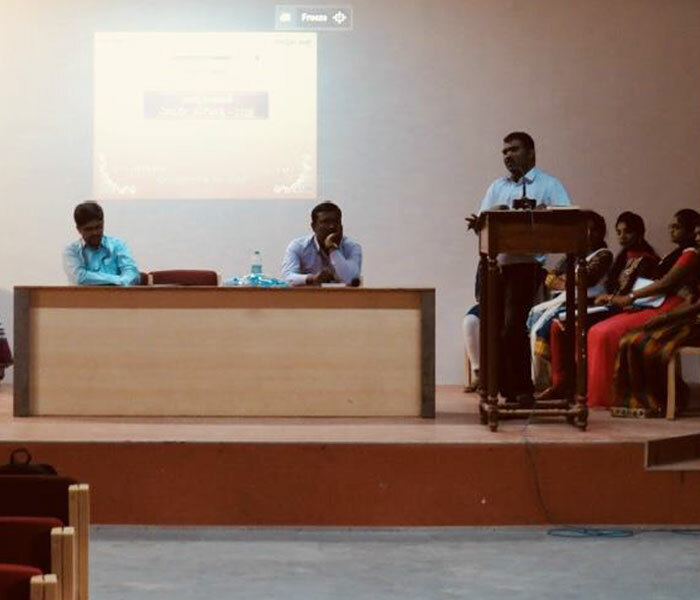 The Department of Social Work organized a Social Innovation Lecture on Child Protection Policy .. 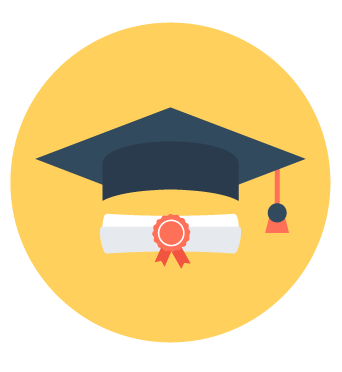 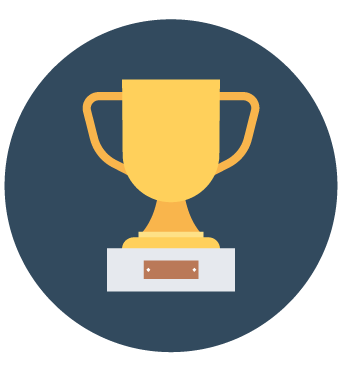 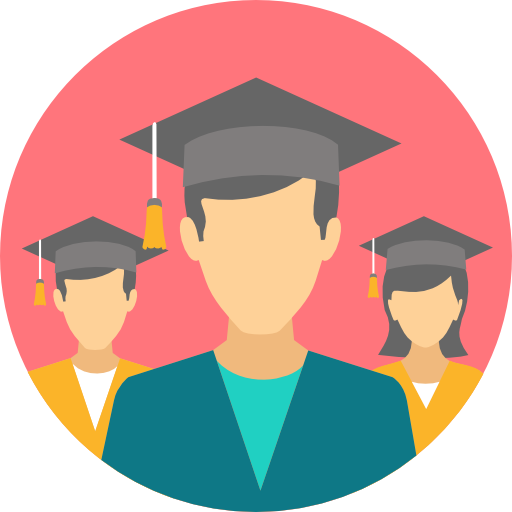 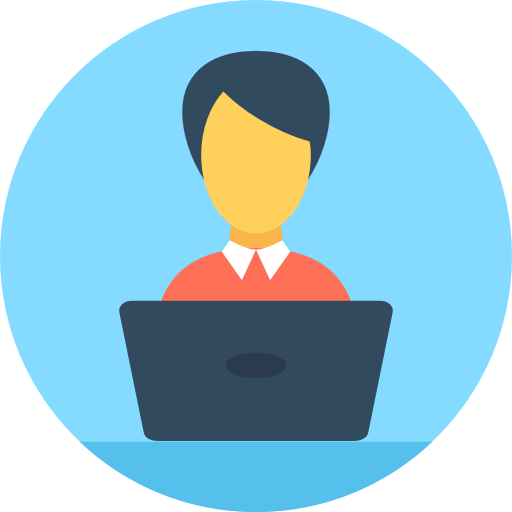 In today’s competitive world, a post-graduate degree or a professional qualification has become.. 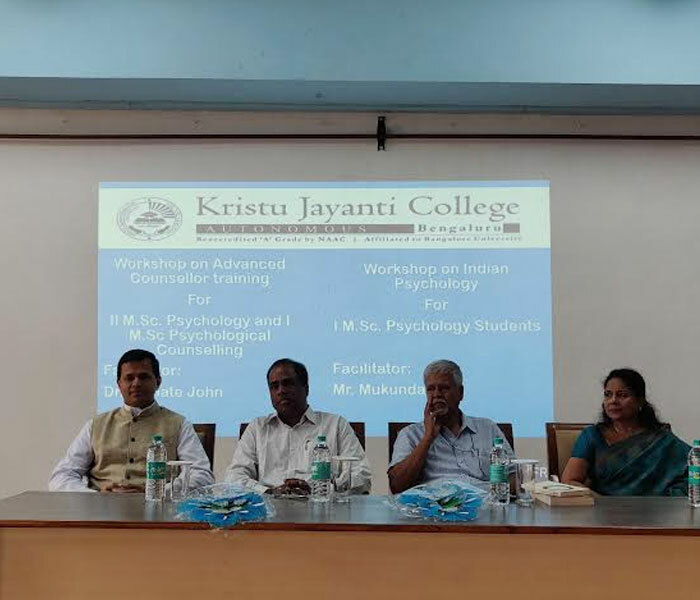 The Department of Economics of Kristu Jayanti College organized one day conference .. 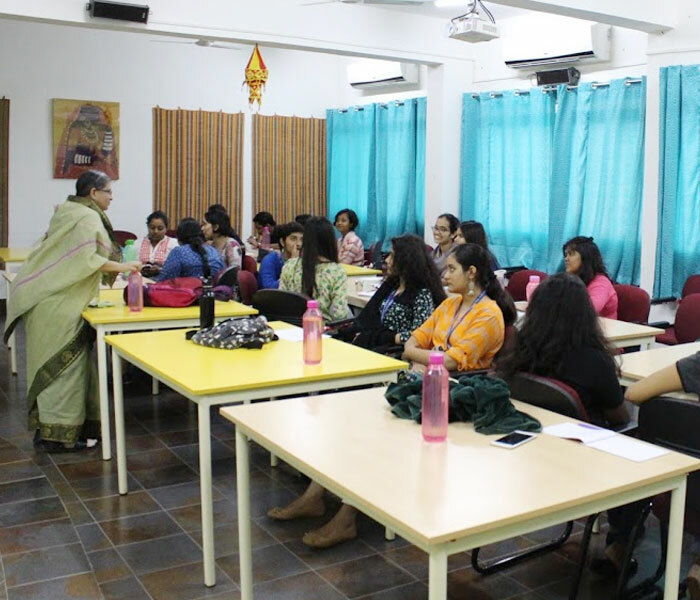 The Department of Social Work organized a two-day workshop on Transactional Analysis on 16th and 17th March 2018..
“The idea of spreading the message of good cinema is getting lost by the minute. 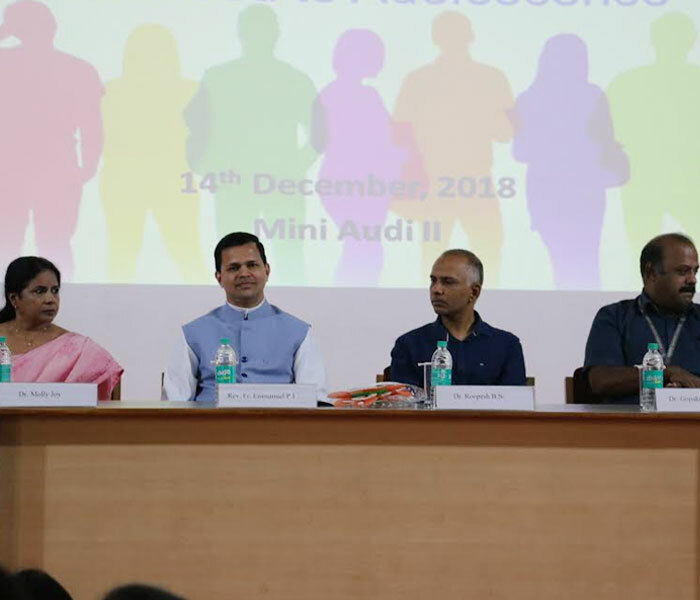 It is important that we expose .. 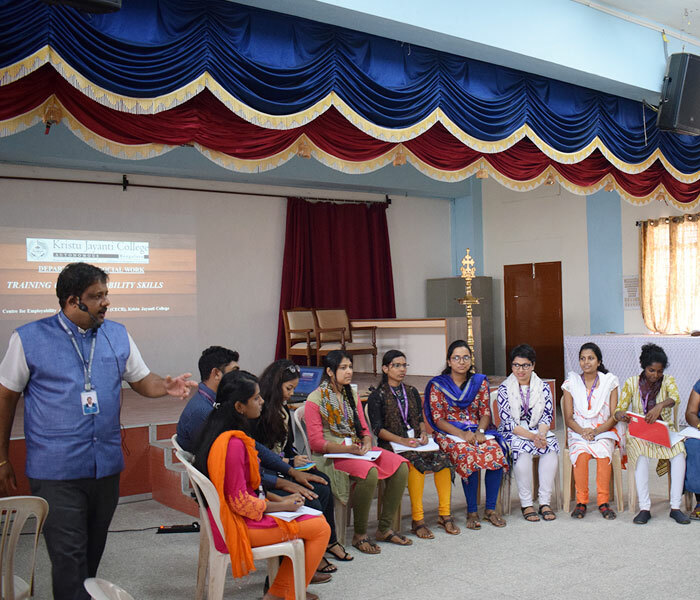 Gender is the socio-cultural phenomenon of the identification of people as male and female with each having associated characteristics.. 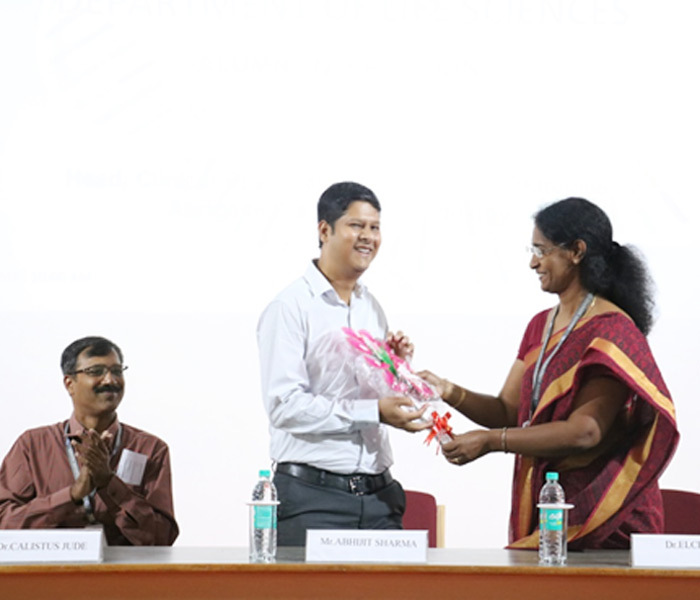 The department of Life Sciences organized a seminar on “Microfluidics” in association with C-CAMP- NCBS, Bangalore..
As part of the Distinguished Lecture Series, the Department of Social Work organized a lecture on..
Department of Journalism and Mass Communication organized a guest lecture as part of the international lecture series on.. 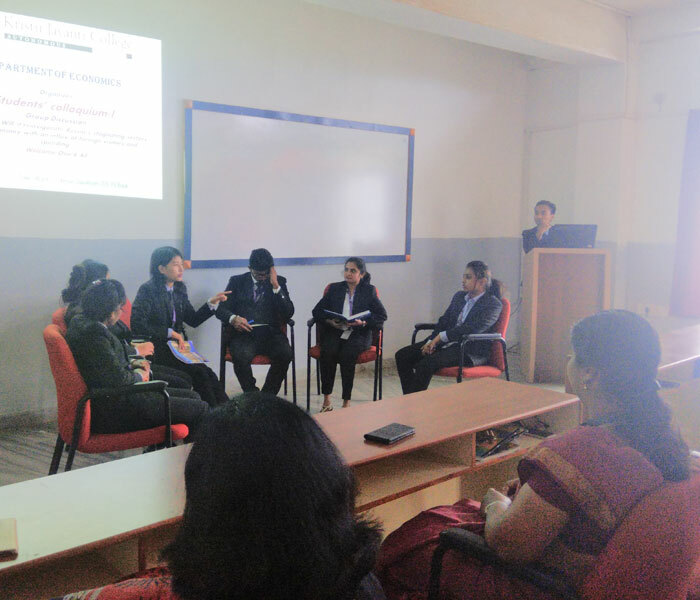 The session began with discussion on different crisis including Human flow with special mention of 65 million refugees worldwide..
Students of Department of Management (BBA) won the overall championship in the intercollegiate management fest held at MLA First Grade.. 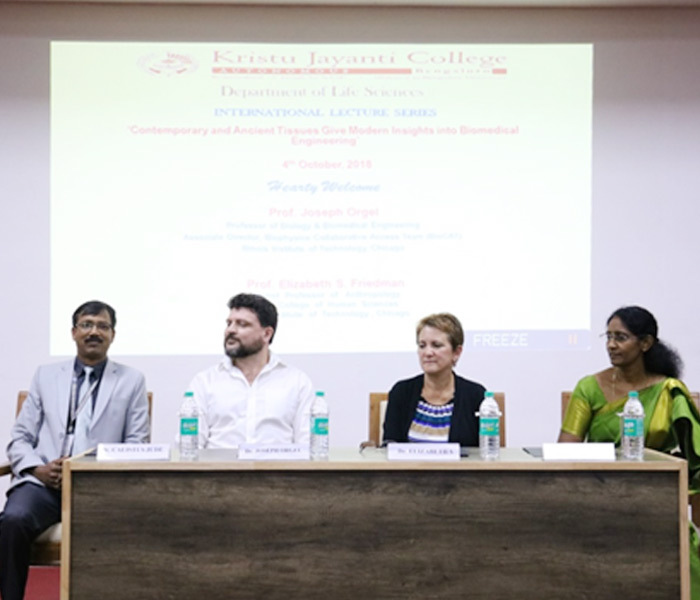 The department of Journalism and Mass Communication organized an interaction with the Indian film Director Mr. Kranti Kanade..
On the afternoon of 15th September 2017, the third semester students of the Life Sciences department,.. 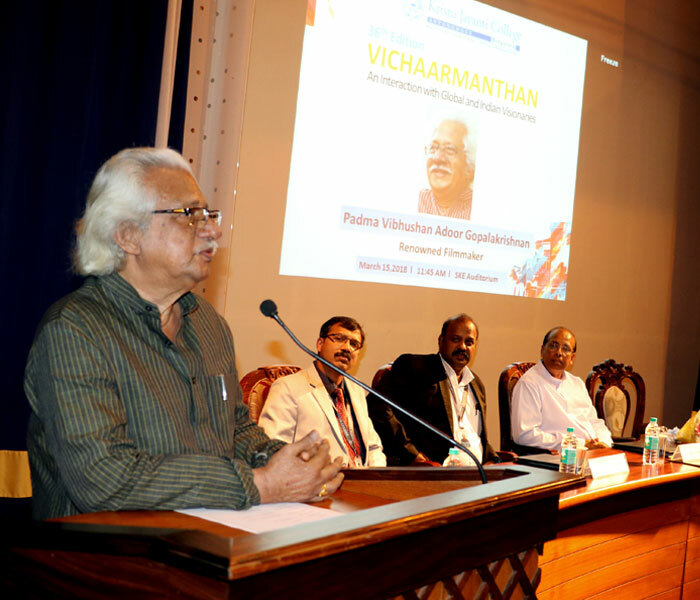 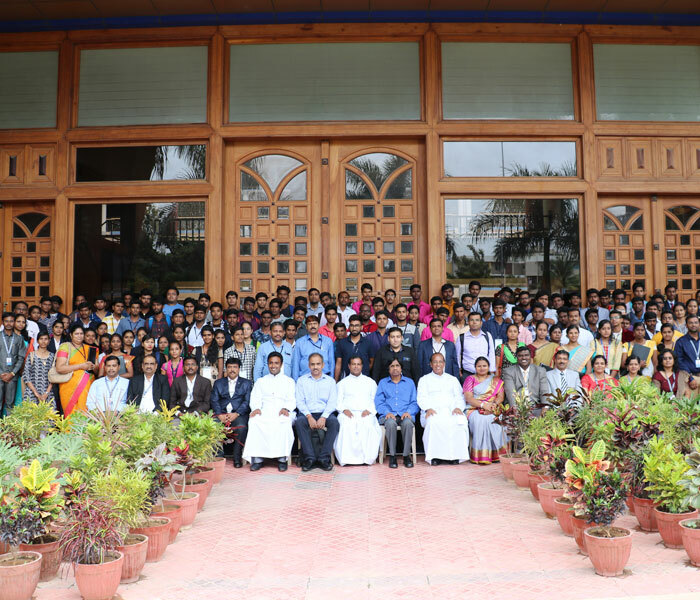 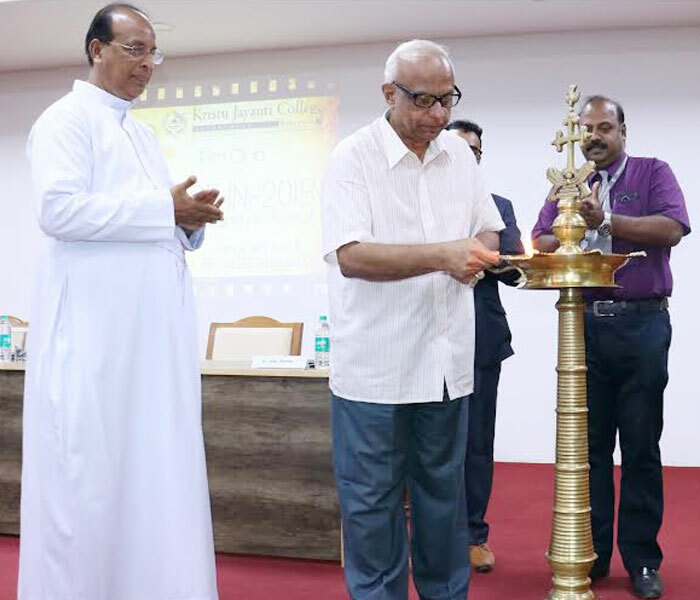 The NCCI 2017, the conference on Computational Intelligence has seen the participation from across the nation from both Industry and Academia..
VIGNANAMANTHAN –An interaction with science stalwarts was initiated by the department of Computer science (UG)..
An International expert talk was organized on 14th September 2017 as part of knowledge enrichment programmes..
Talk on “Clean and Green India"
The Environment Club of Kristu Jayanti College, organised a talk on the topic "Clean and Green India".. 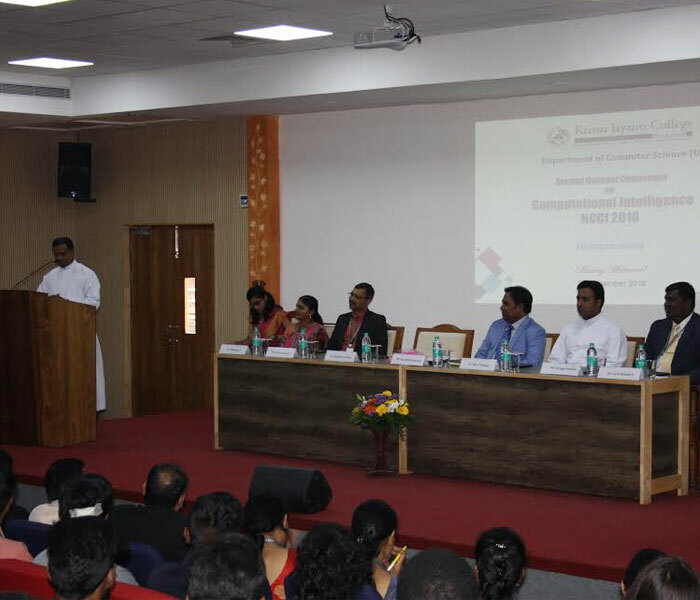 Entrepreneurship and Innovation Centre (EIC) Young Entrepreneurs Series Collaboration and Networking (YES CAN).. 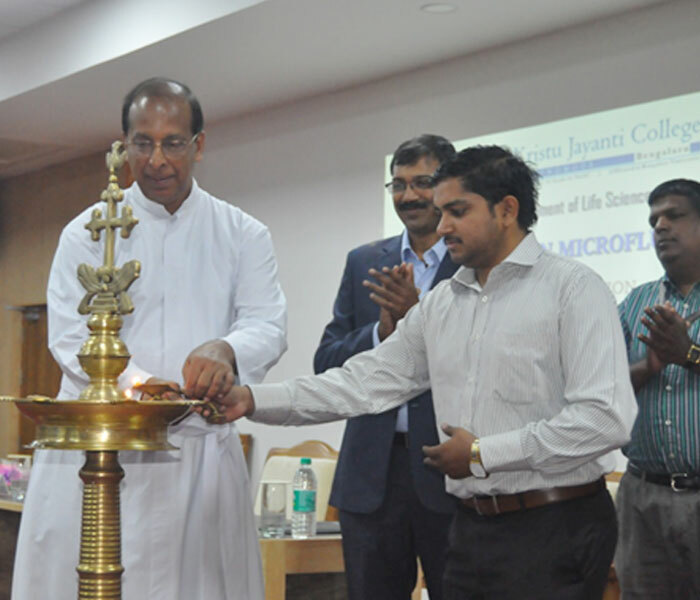 The Department of Social Work of Kristu Jayanti College, Bangalore organized “Mitra Milan”.. 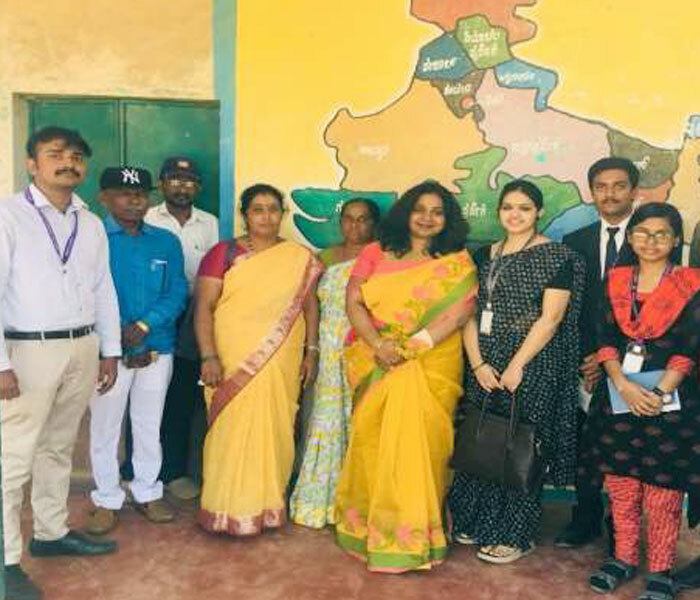 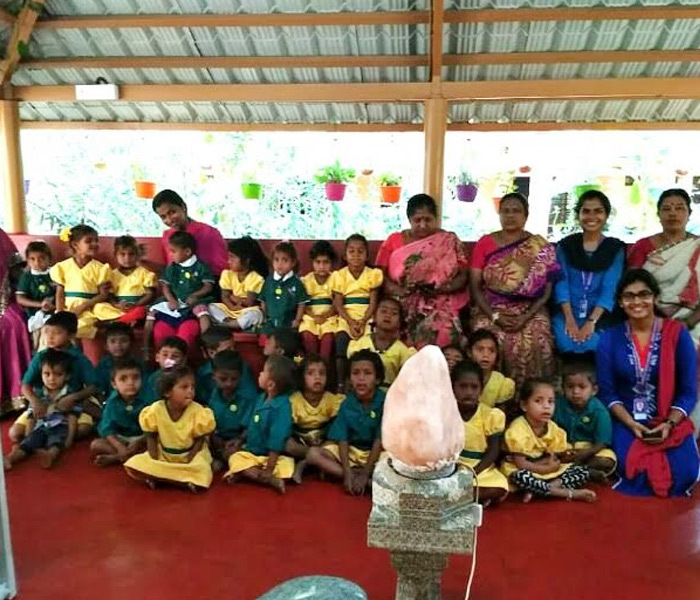 The Department of Social Work, of our college has successfully completed the evaluation of a health development project for World vision India recently.. 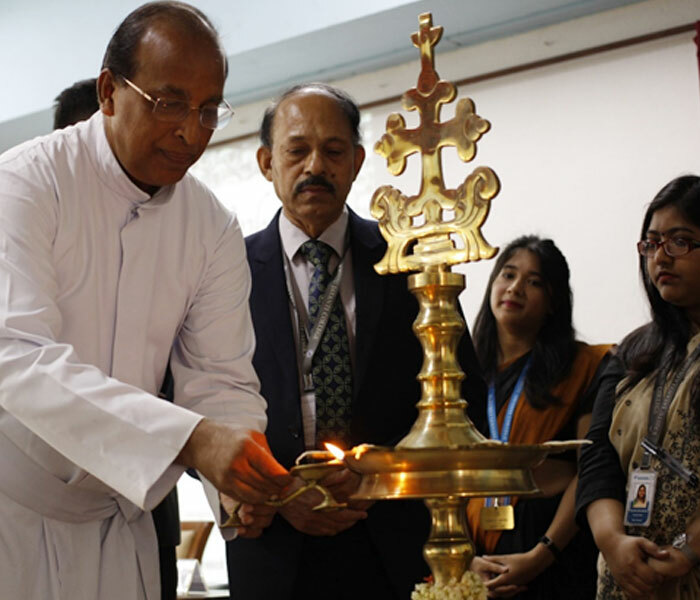 The first ever Model United Nations (MUN), was inaugurated in Kristu Jayanti College on September 1, 2017..